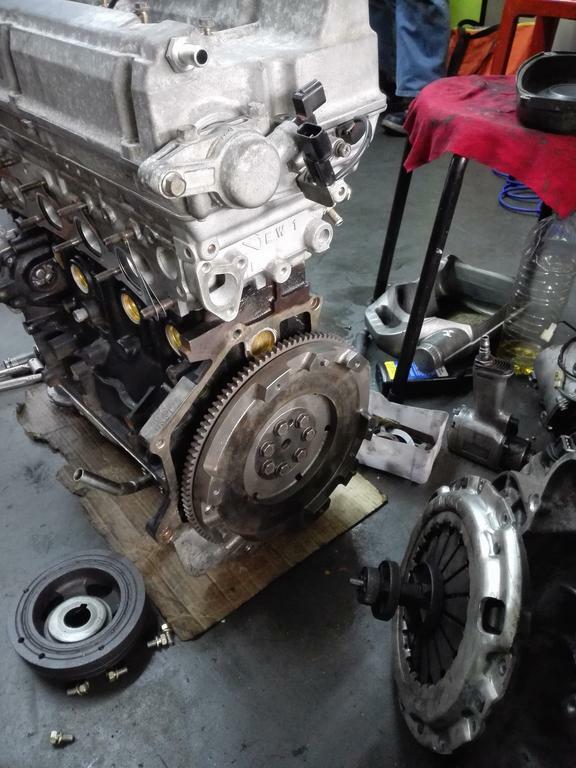 Hi guys, I'm from Malaysia and after the failure of my previous engine(Mitsubishi 4g18 bolted-on turbo), I decided to build up a 4g93 MIVEC Turbo engine as it's new replacement. 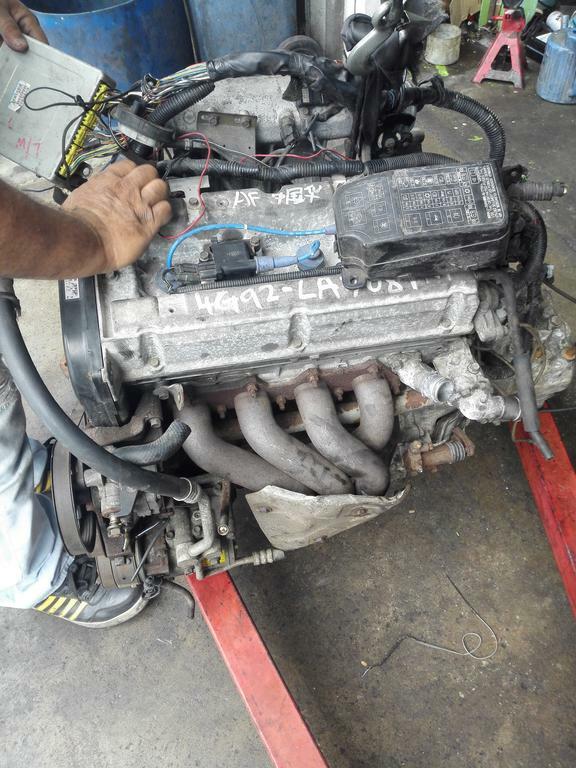 Currently it had been nearly 10 months since my engine blew and the new engine is still being built as we speak. Slow progress due to limited time and slowly saving up money for the parts. 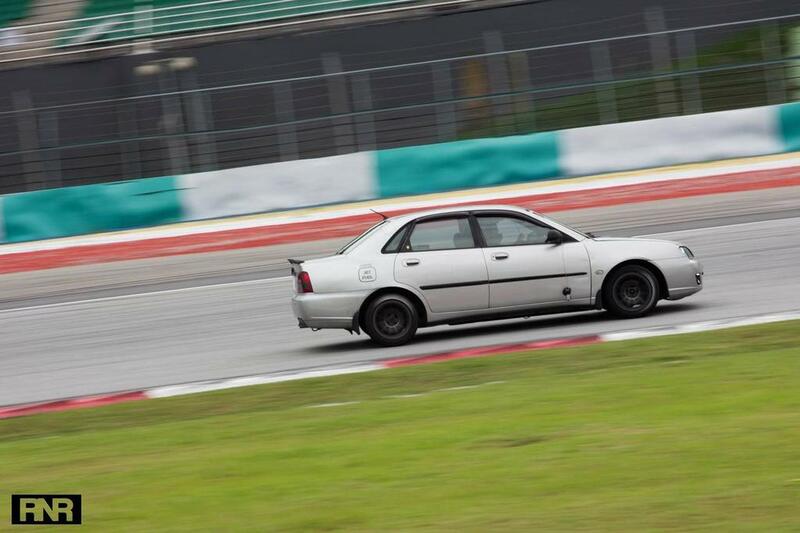 Building the car for everyday-drive and also occasional visits to the track and B-roads. An overall view of my car can be viewed on my friend's writeup at http://www.racenotrice.com/diywaja.html though, that article was written when it was still running the old engine. 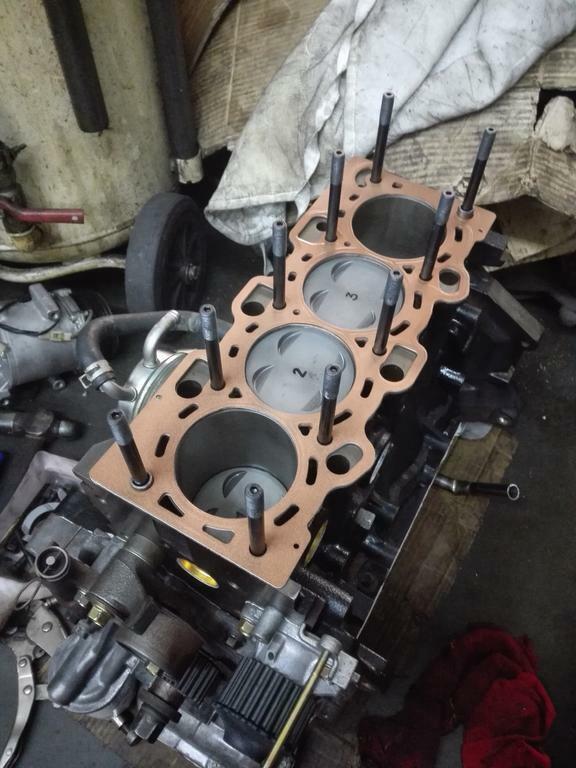 This thread will be more about the rebuild of my new 4g93 Mivec engine as I proceed and will be quite detailed as I am doing it mostly by myself. 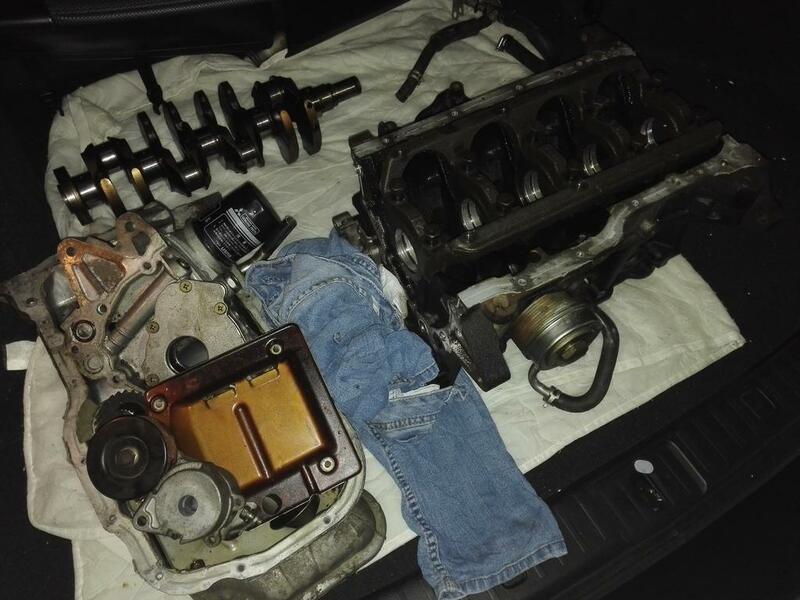 I have a very close relation to my workshop and mechanic and will be building my engine under his guidance so this thread will be pretty detailed. I had worked for him before so I actually have some experience building engines, plus my old engine was also built by myself as well. 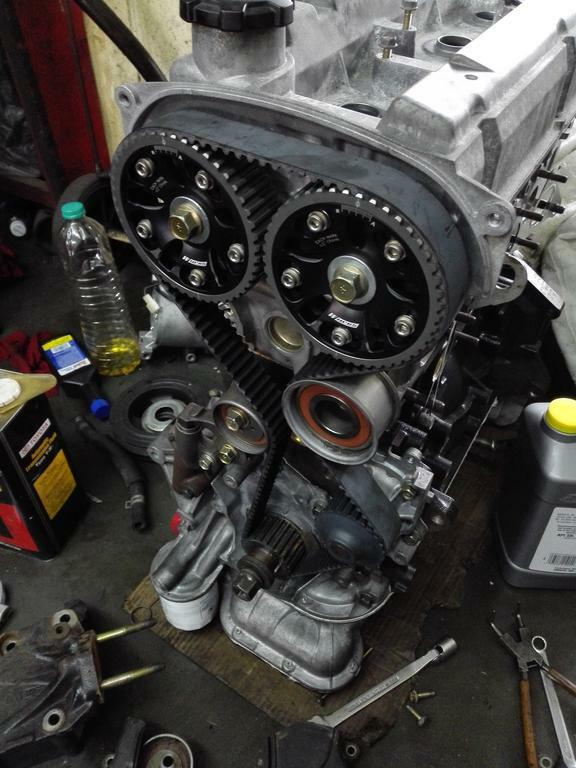 New engine arrived from the chop shop! 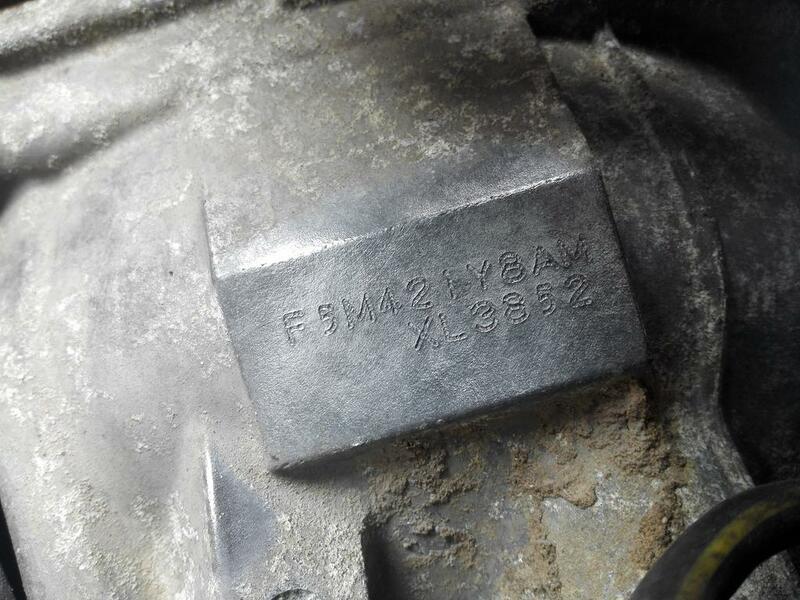 Gearbox code. Couldn't find any information about these online, but apparently they're from the latest model and have a shorter ratio 2nd gear. 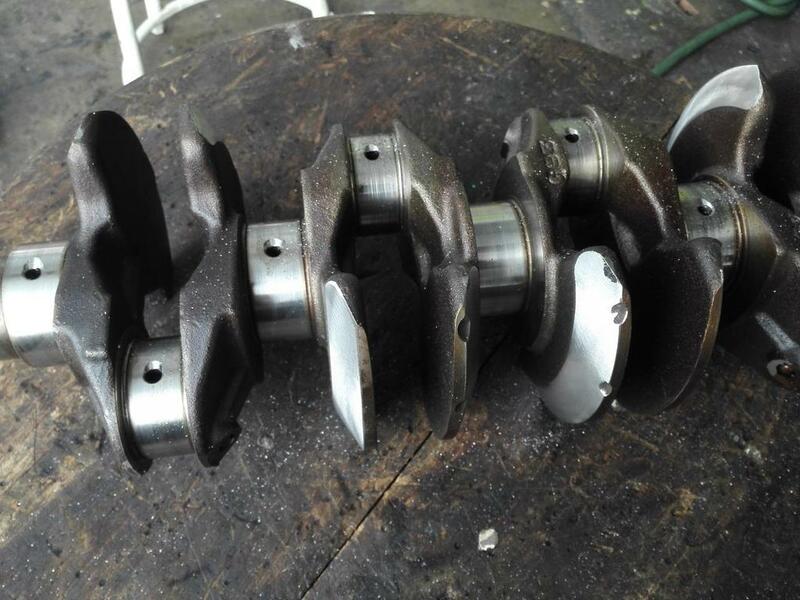 Too bad I won't be using these as well, sold off the gearbox and bought a long ratio gearbox which is more suitable for turbo and everyday driving. First time holding Titanium valves. They're mind-bogglingly light! 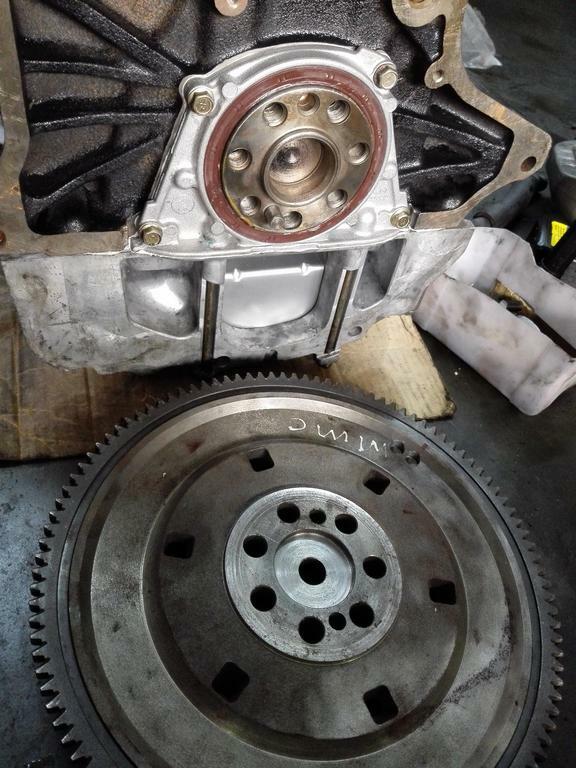 Tore down the gearbox and... wait.... ARE THOSE CLUTCH PACKS?! Ultimate jackpot! 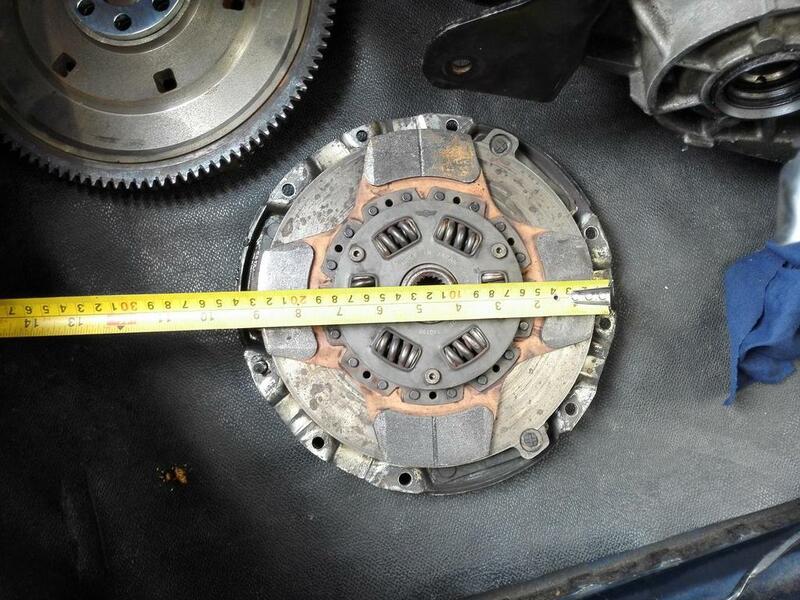 The gearbox came with Cusco Type-RS 1-way clutch type LSD! 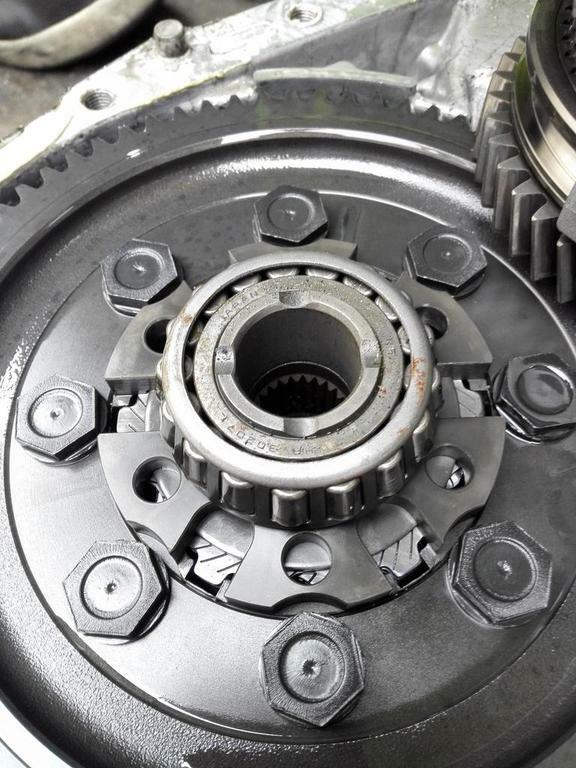 Tore that apart as well, barely any wear on the clutch packs, looks nearly brand new! 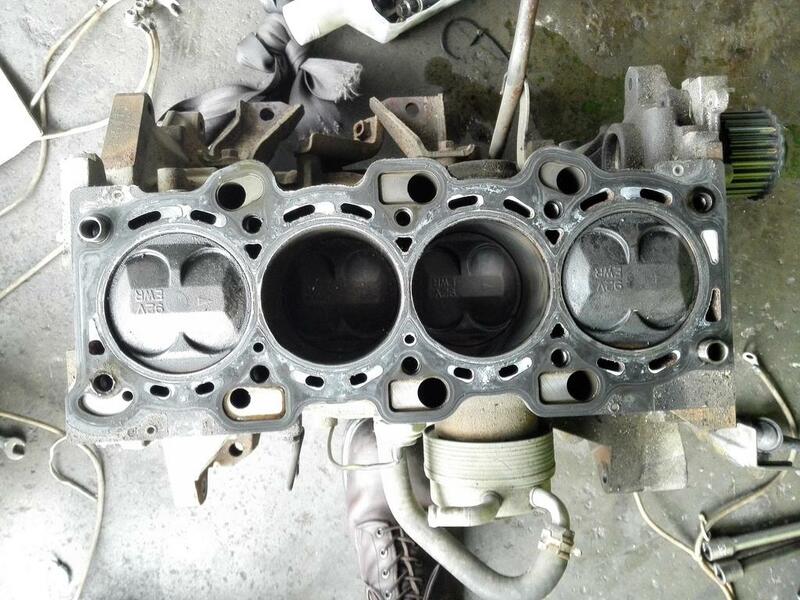 Manage to source a 4G93T GSR block and accessories without piston for cheap! 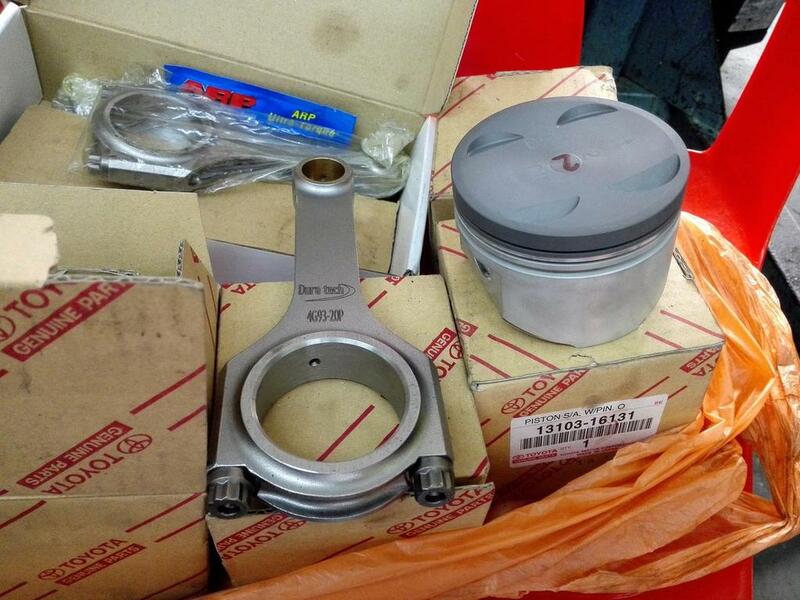 Bought a set of Duratech conrods and 4agze higher comp pistons. Duratech is apparently a Malaysian brand but made in China, though it comes with legit ARP bolts and have a pretty good reputation around. 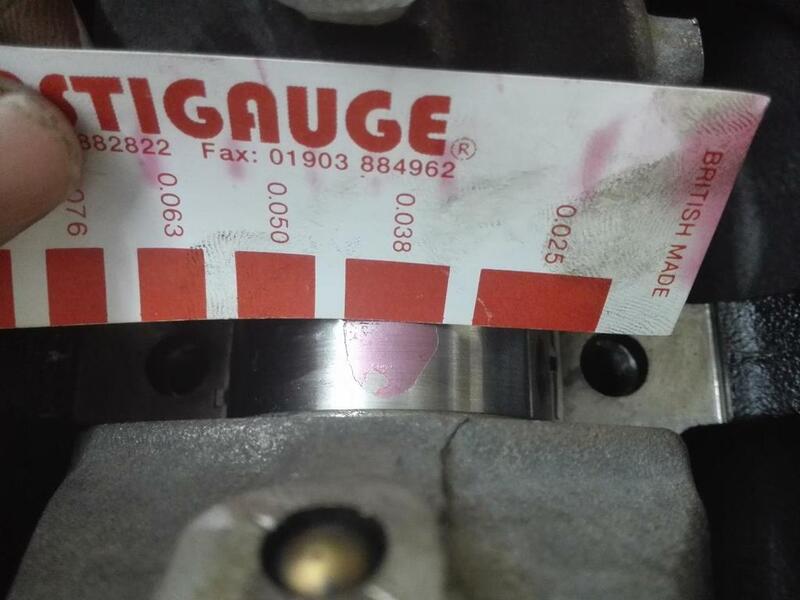 4agze pistons comes in 2 flavours, the older model have a lower compression and much deeper cavity than these. 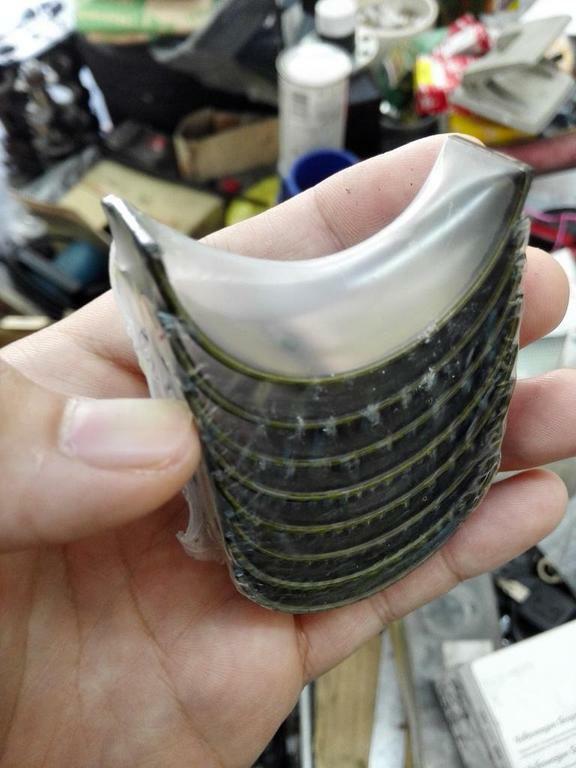 The pistons came with original Toyota rings. Ring gap looks good! Took the old bearings from the 4g92 and measured, got pretty tight clearances! Pretty surprising considering these are old bearings. 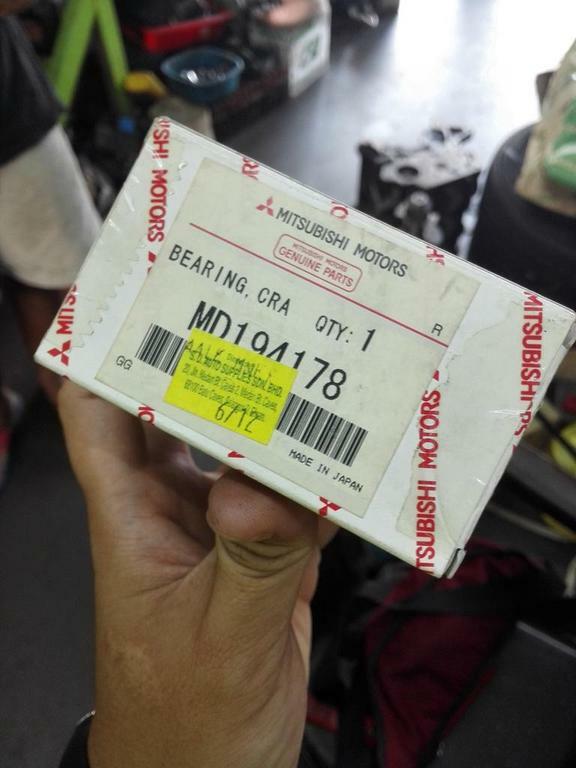 Not contemplated with using old bearings, the hunt for original MIVEC bearings starts, and in the end manage to source only RED main bearings, costs a whopping RM500(USD120~) for just the main bearings! Clearance same as the old Green MIVEC bearings, so I guess it's usable. ACL Race bearings for the conrod as I couldn't source the MIVEC conrod bearings and the conrod bearings seem to have no difference in design unlike the main bearings. 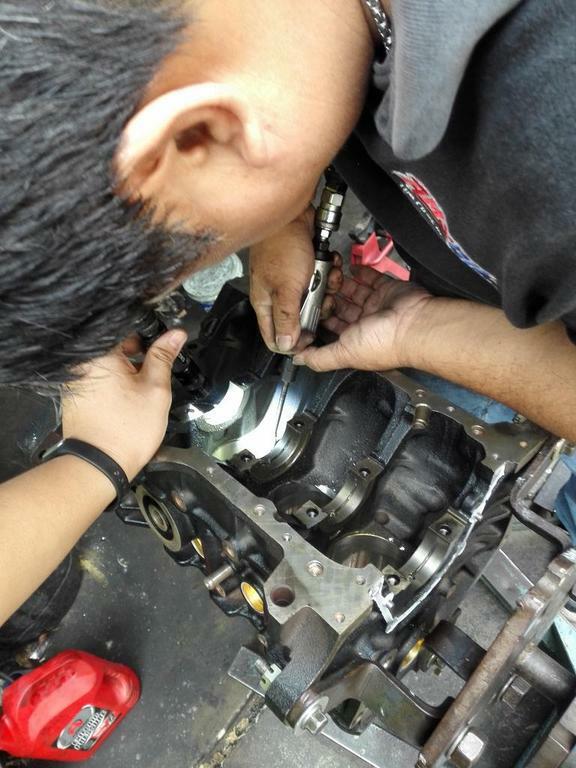 Finally the bearings and pistons gets installed! And just as quickly as it was we installed, we hit a snag! 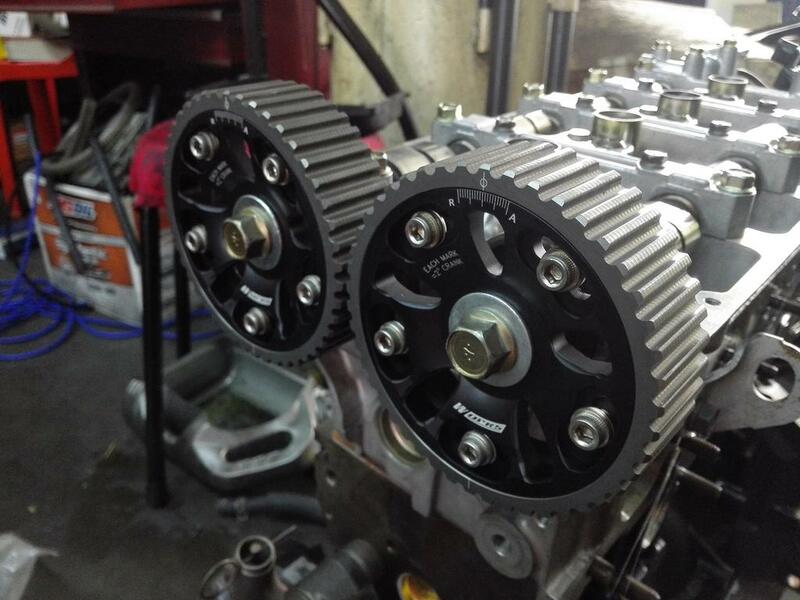 The new forged conrods are JUST BARELY touching the block, but it's definitely touching! 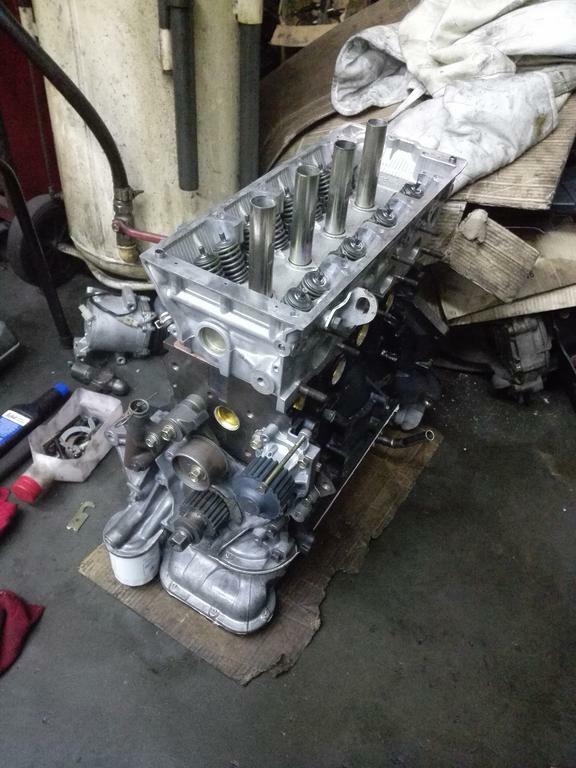 Put everything back together again and install the rest of the short block. 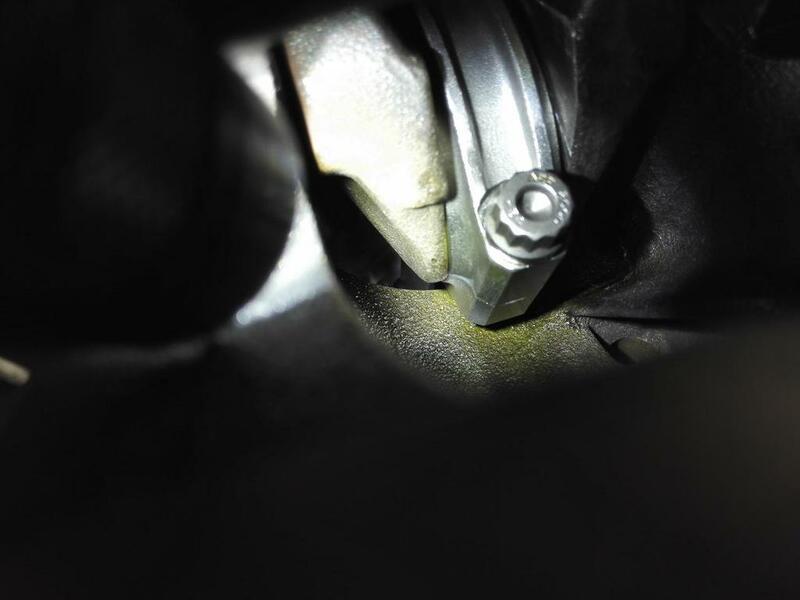 Also preloaded the oil pump pressure relief valve spring with a nut to increase the oil pressure but did not take a photo of it. With the block done, next up is the head. Ported the ports slightly and gave it a smooth finish. 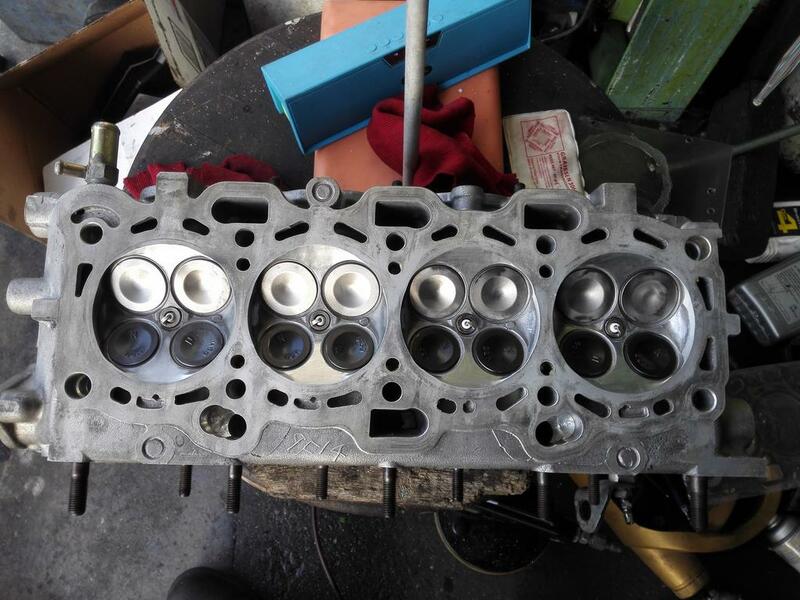 Time to CC the head, in order to calculate compression ratio and also to equalise all 4 squish area volume. 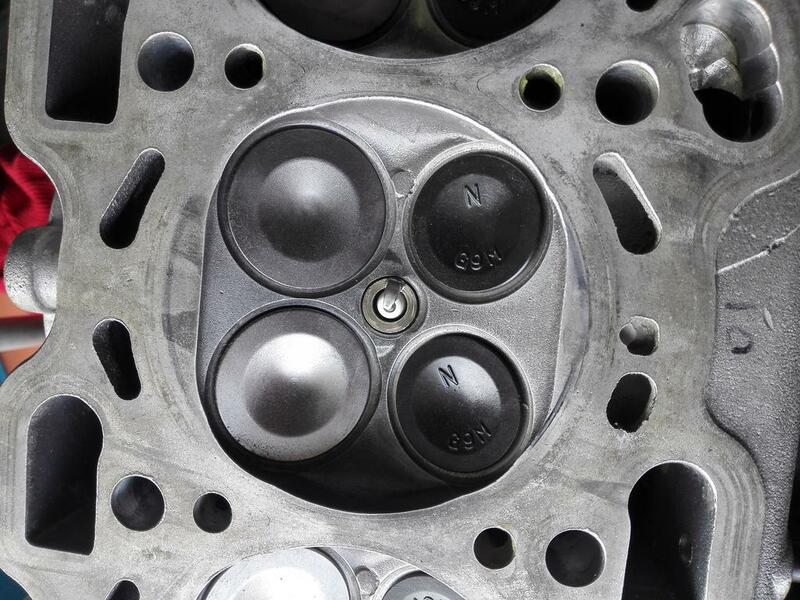 The theory behind this is to ensure that the compression ratio of all 4 cylinders are the same and in theory should reduce vibrations or unequal fuelling issues and possible performance gains. 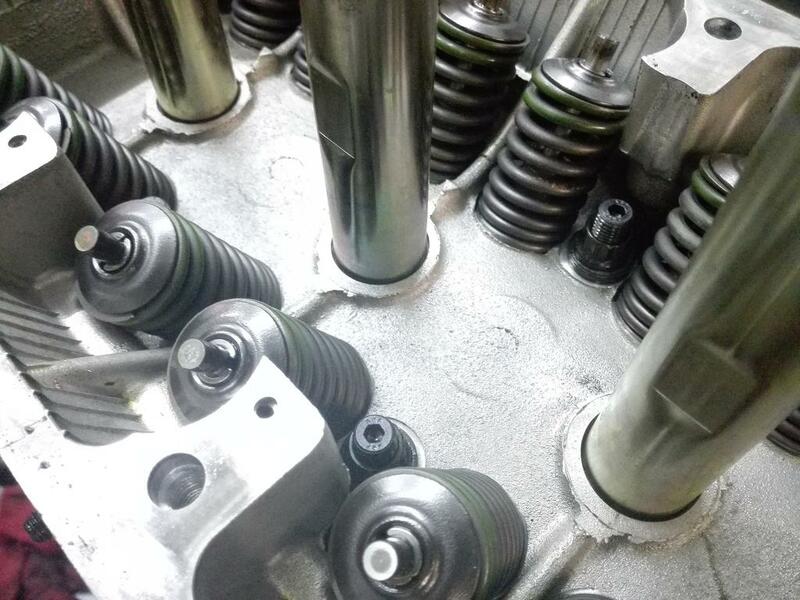 Slight differences between each cylinder, but in the end managed to equalise all 4 volumes down to 0.1cc accuracy by drawing out the gasket as a guideline and grinding material off the head. And.... we had catched up to the current progress already. I literally just CC'd the head earlier today. Will post more stuff as I progress. Thanks for spending your time(and bandwidth ) for reading my super long post. 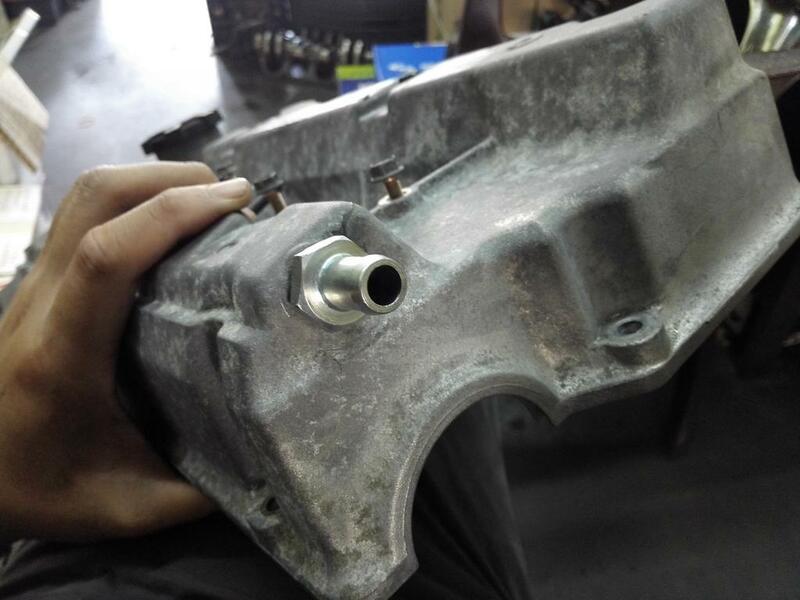 Looks like the previous owner ran an EGT sensor, the turbine housing came pre-drilled. Perfect! 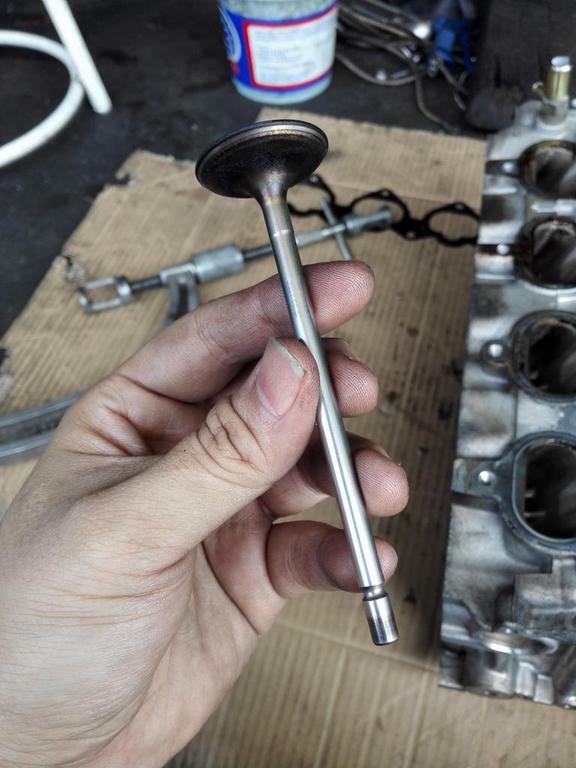 Original Evo 6 blow off/recirc valve. 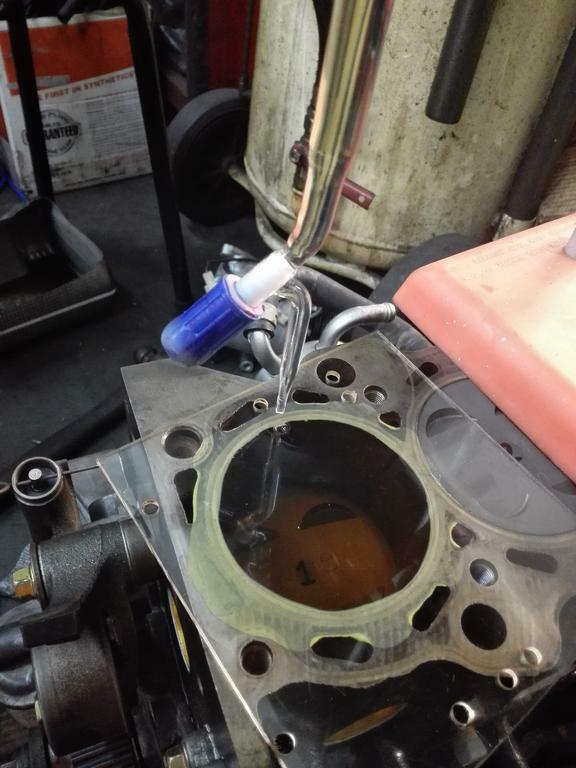 Can't afford a 'real' blow off valve yet, this will do. Feel free to ask any questions, I'll be glad to answer them! Very nice work and pictures. Seriously lucky find with the Cusco lsd, I'll be keeping an eye on this build. keep it up! I haven't really been on here for a while, been busy building really, really big mivecs. I'll just pick out a few points and hope you don't get too upset? You mention not much difference in lift between the high and low lobes. Lift is the difference between base circle and the top of the lobe. There IS a big difference. 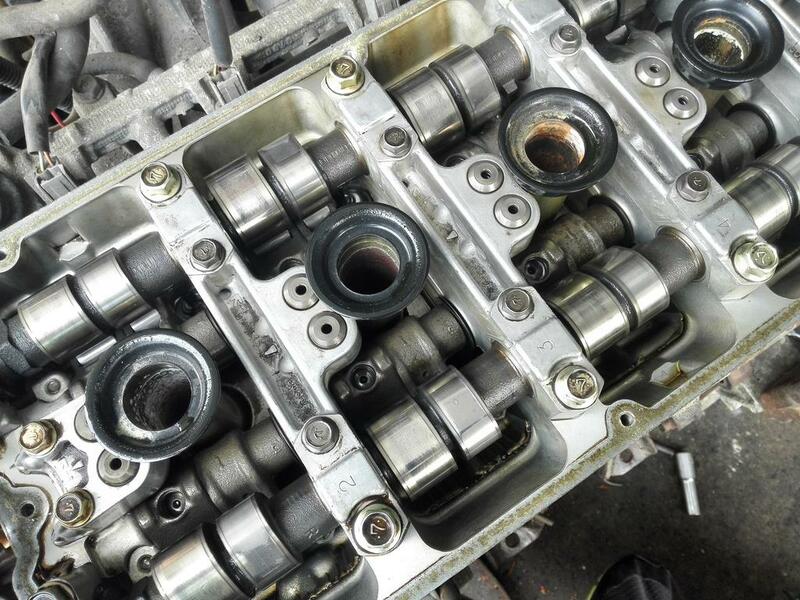 Your bearing clearances, the new bearings with bigger clearance is what is required for a race engine. 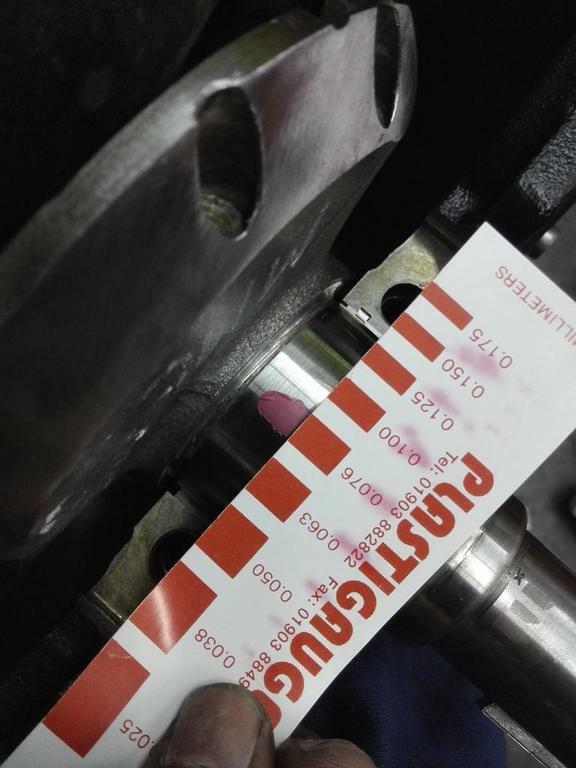 Plastigage is useless, you need to buy a micrometer. 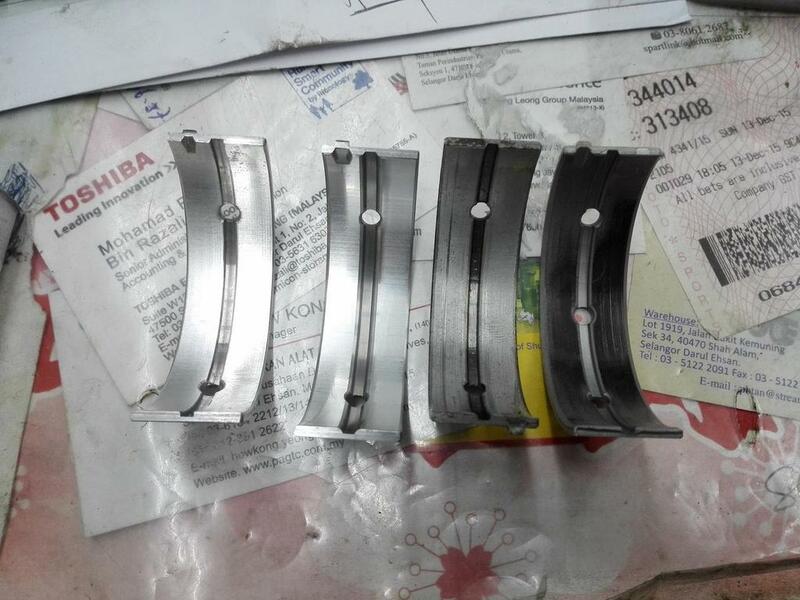 ACL race bearings have more clearance than stock, by 0.001 inch or about 0.025 mm. 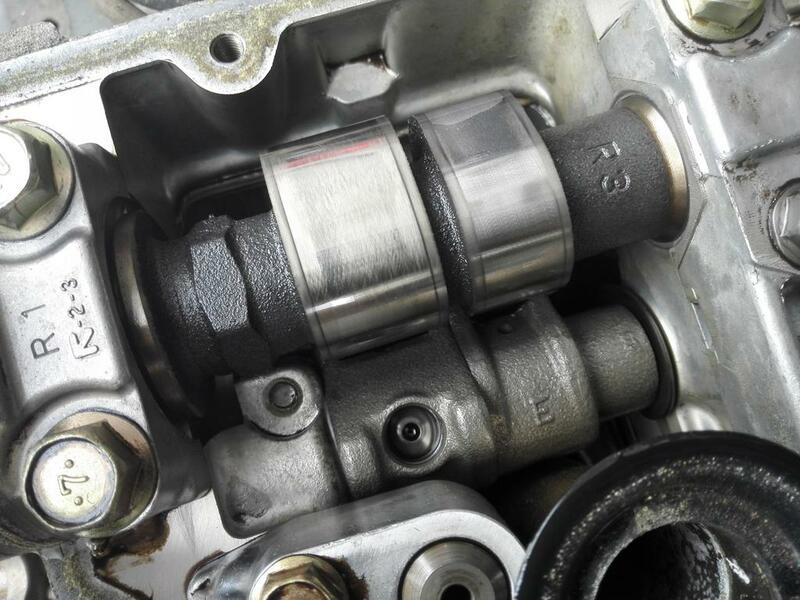 Your compression is probably a bit too high for a turbo. I'll guess at 9.2. A CR of 8.0 is far safer. You've ground away at the head to increase volume. The part you've cut away is known as the "squish". It's there to make turbulence and so decrease knock. Having too much compression makes knock, as does removing the squish. 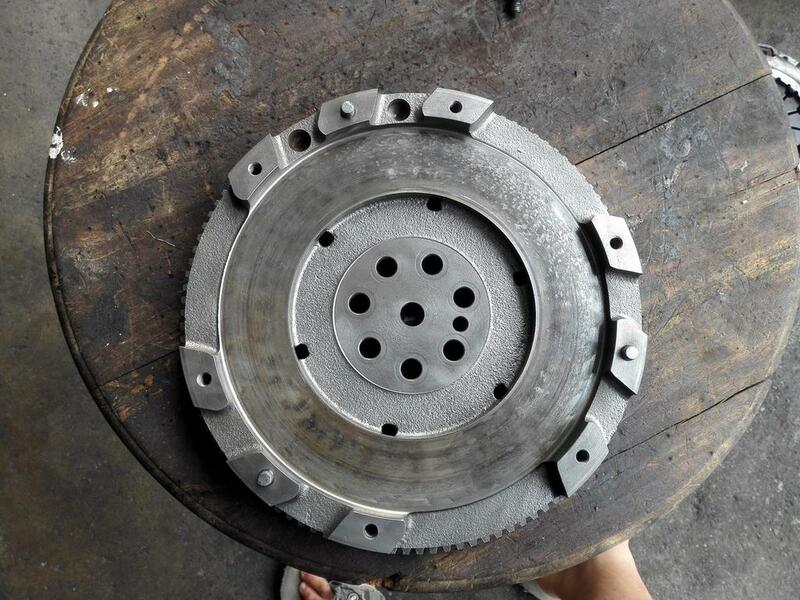 You champhered the oil holes on the main journals on the crank , I think you did the wrong side. The big ends look OK though. 4AGZE pistons are forged, you need more than double the piston to bore clearance, they won't fit a std bore, it needs honing out a bit more. You put a washer under the oil relief valve. It doesn't actually increase the oil pressure, it's an internet myth. 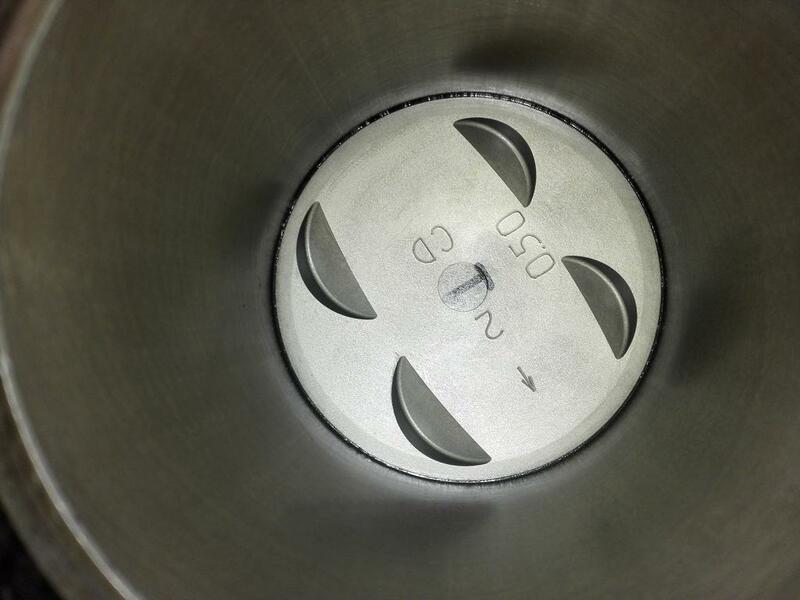 What it does is that it increases the pressure at which the relief valve will open. It's normally about 80PSI and it should only open when the engine is cold, the oil is thick and you rev it too much. 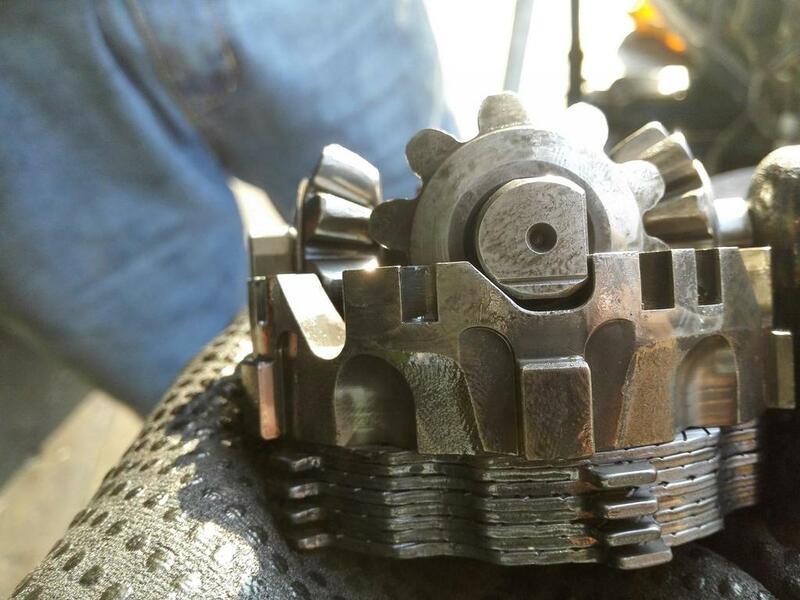 Under normal working hot conditions it won't open so modifying it won't do anything worthwhile, but it will add stress to the pump gears unnecessarily. 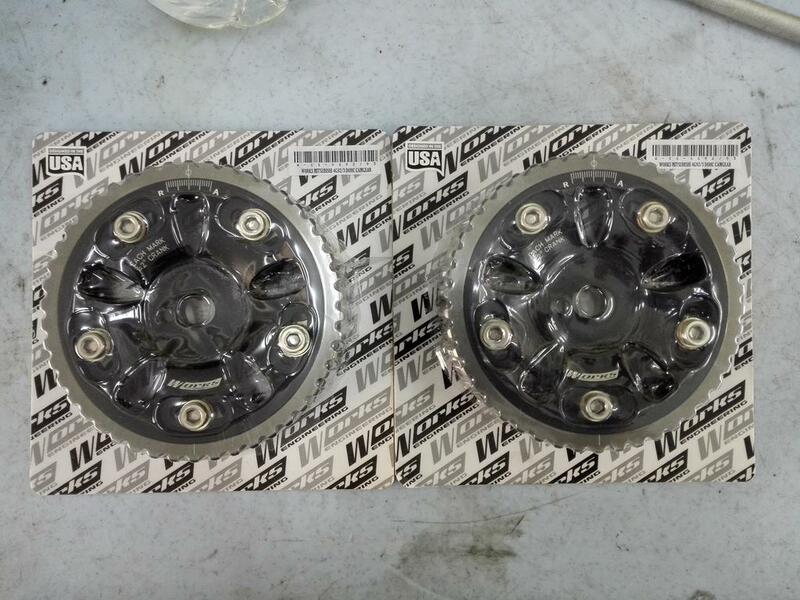 The factory BOV.............they're actually better than aftermarket ones, easy to modify to hold more boost. Apart from that, your power will be limited by the turbo, but it'll make plenty. 1. 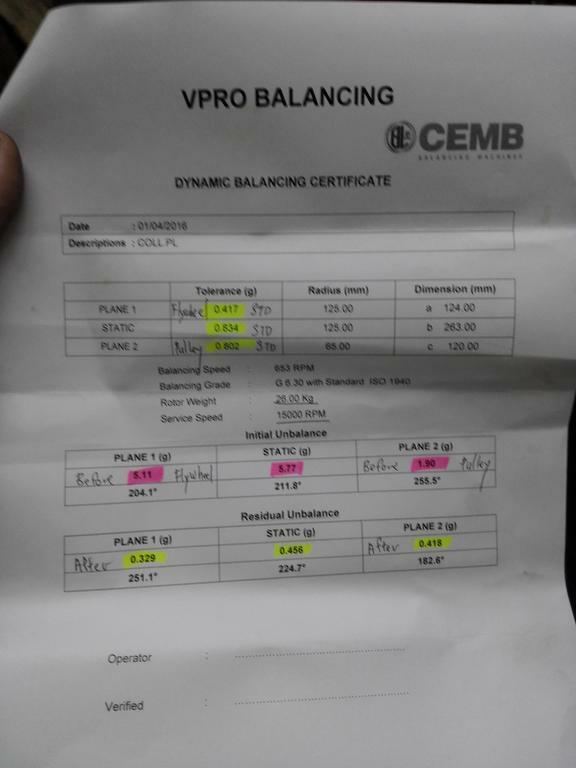 Yes I understand how the lift is determined and there is a difference, what I'm saying is the difference is minimal as the RS cams are known to have smaller differences in lift between the low and high cams but large difference in duration, at least visually when looking at the cam. Here's a closeup on one set of the lobes, not exactly big difference i'd say, but noticeable. 2. On the bearing clearances, I originally put in Taiho bearings which gave me 0.078mm clearance which is too big for my liking. 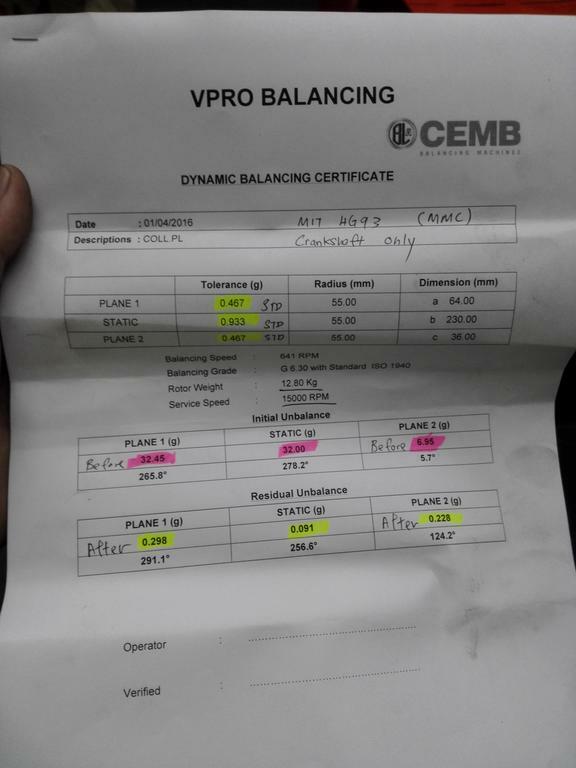 I'm taking the specs off the 4g9 manual as reference and it is stated there std clearance is 0.02-0.04mm with a limit of 0.1mm and am currently running 0.038-0.05mm of clearance with the new original MIVEC bearings which is at the upper limit of the std clearance, but is a fair distance from the factory limits. The bearing that I managed to get is the RED one and according to the manual, that should give me the loosest clearance of all bearing colours. 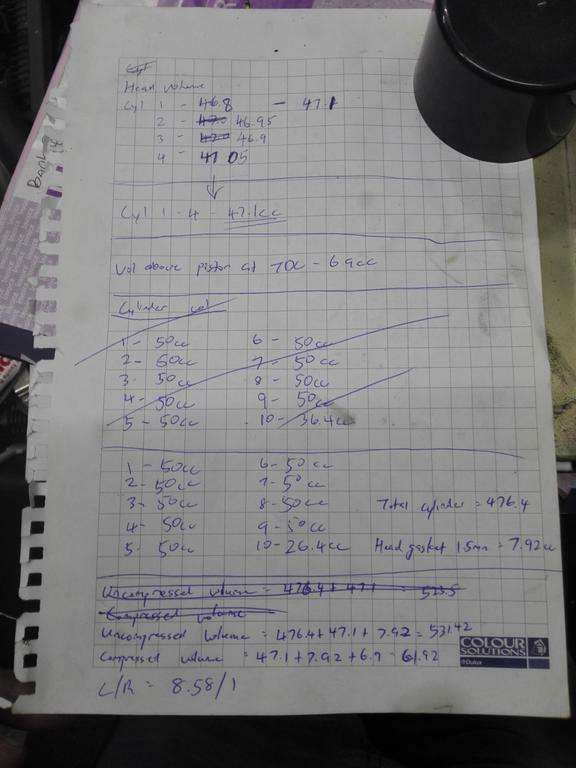 ACL Race is only used on the conrod bearings and it gave me a clearance of around 0.05 as well if i recalled correctly. 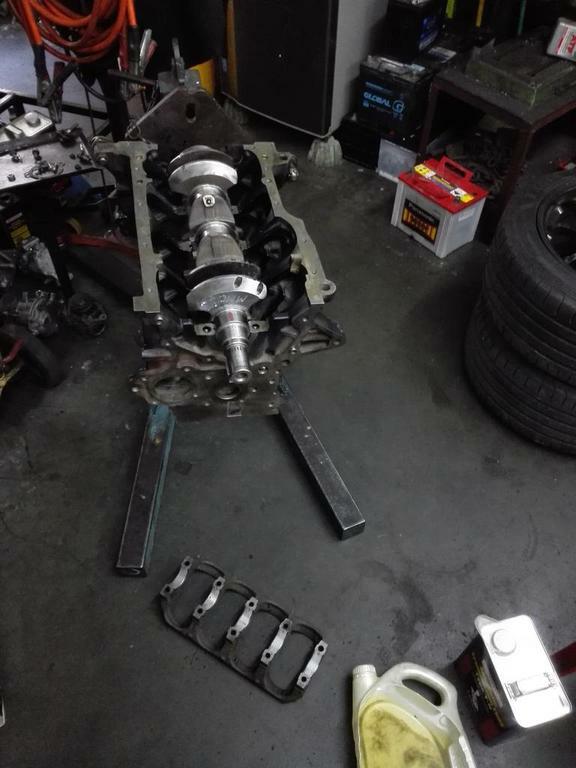 Plus I'm not building a race engine per se, this engine would be for everyday drive with occasional spirited drive and track visits so the ultimate goal will be reliability, longevity and decent power, nothing too crazy. 3. I just measured my CR yesterday and got a final reading of 8.78:1. 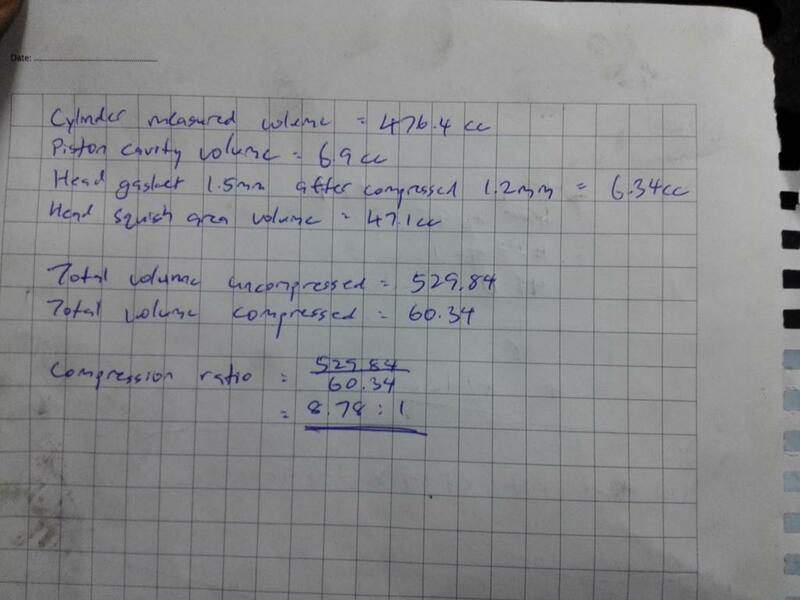 Even before that, I already did a calculation on the CR with both low comp and high comp pistons. 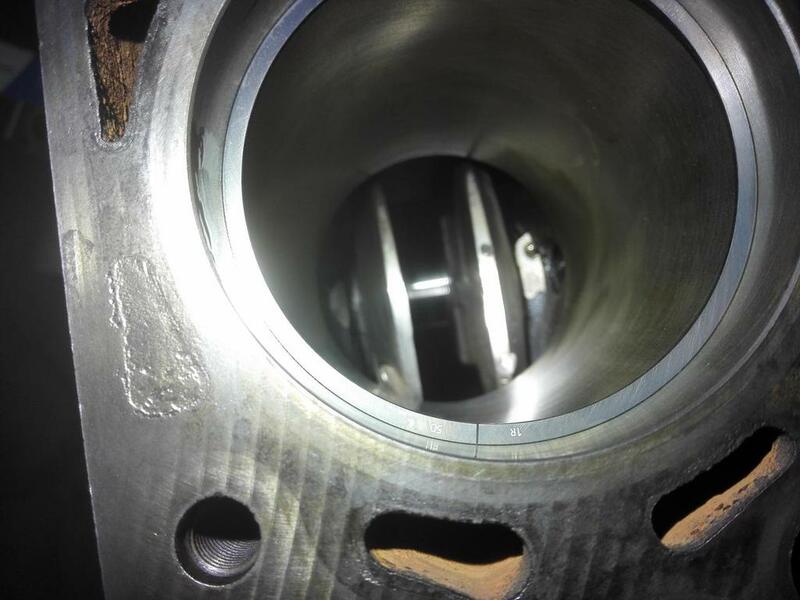 The low comp piston would've given me a CR of roughly 8:1 with a 0.5mm gasket. And as I mentioned, I won't be boosting too high, target would be around 300whp which should be achievable at 1bar or slightly higher . Also didn't want to drop the compression too much as I'll be doing alot of driving off-boost so would like decent response off boost. 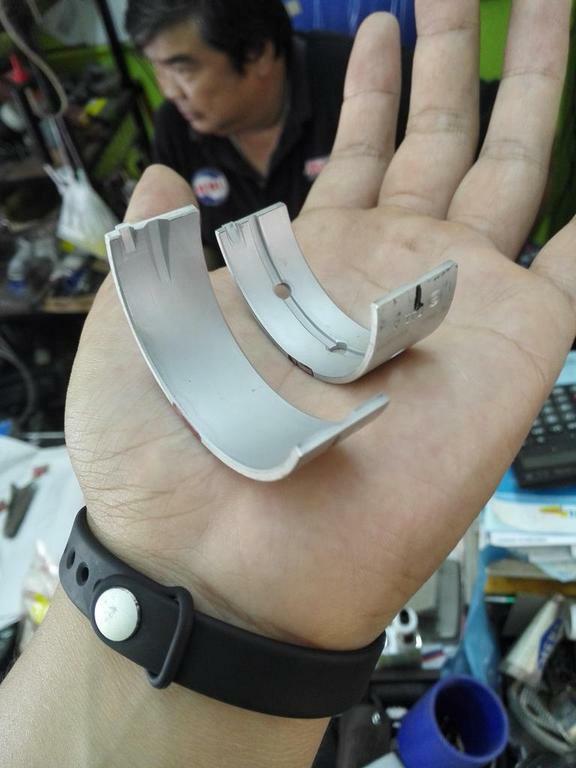 I'll be running RON95 fuel here and probably RON97/RON100 on track days for that extra knock prevention as the temperatures in Sepang is extremely hot. 4. 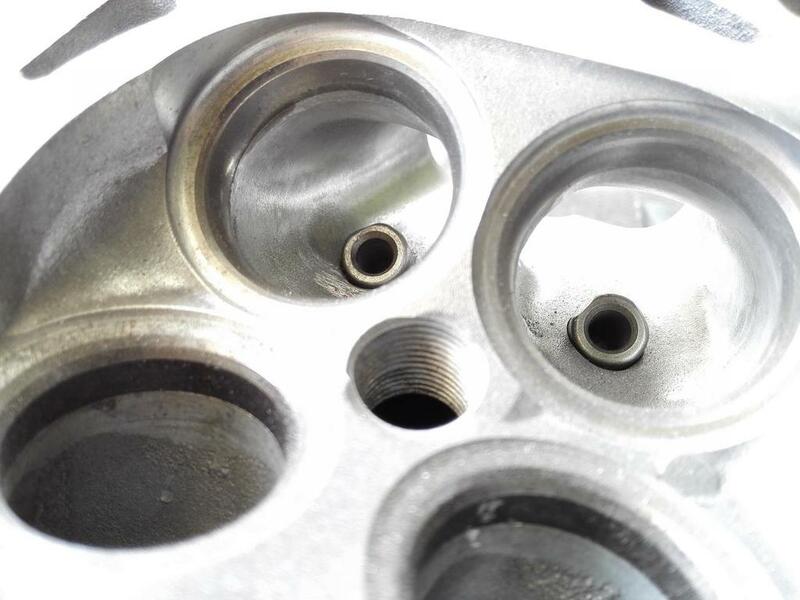 From what I understand, the part I grounded off is known as the "Squish Band" and honestly I do not have much expertise on cylinder head designs, but in my own opinion, by grinding off that small part with the purpose of equalising the chamber volumes, the gains from doing so should offset the potential negatives(if any). Also, with the squish band grounded off and polished, I reduce the amount of sharp edges which should reduce the chance of pre-ignition. I did try to do some research on the squish band but couldn't come up with much information online so if you have a good article, do link me up. 6. 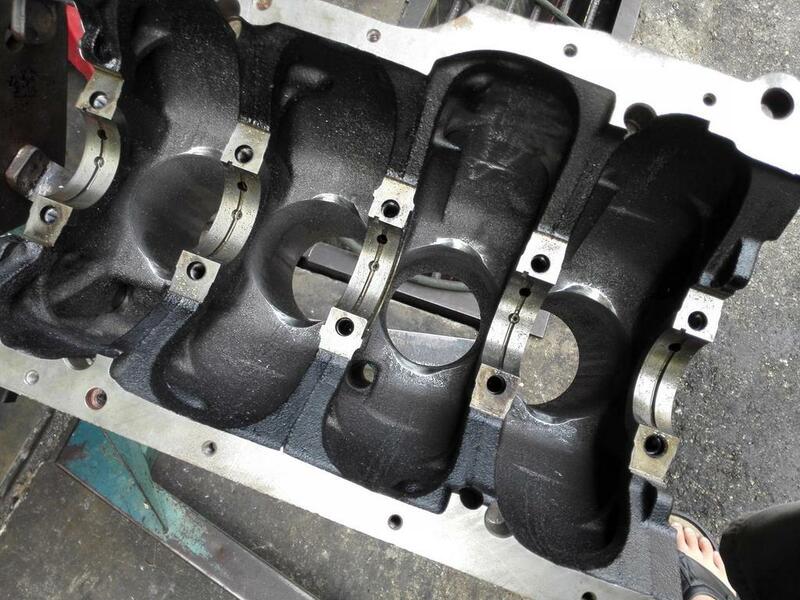 The cylinder walls had been rebored to fit the 4agze pistons as it is oversized(81.5mm) and the clearance had been dictated by the machine shop. 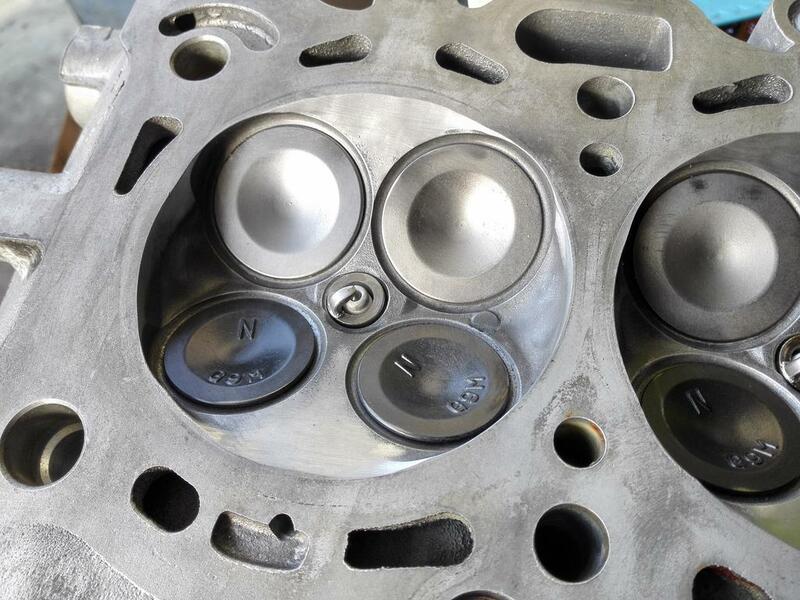 I personally do not believe the clearances for a forged piston should be as large as double the std clearances. 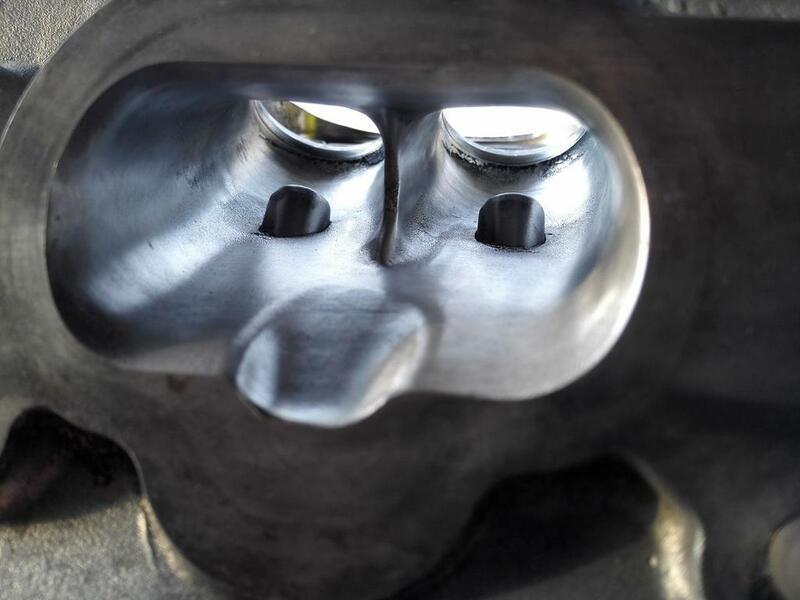 Plus, I don't think these pistons are 'forged' per se, many people online had been discussing about it but still I don't find any conclusive proof that it is. 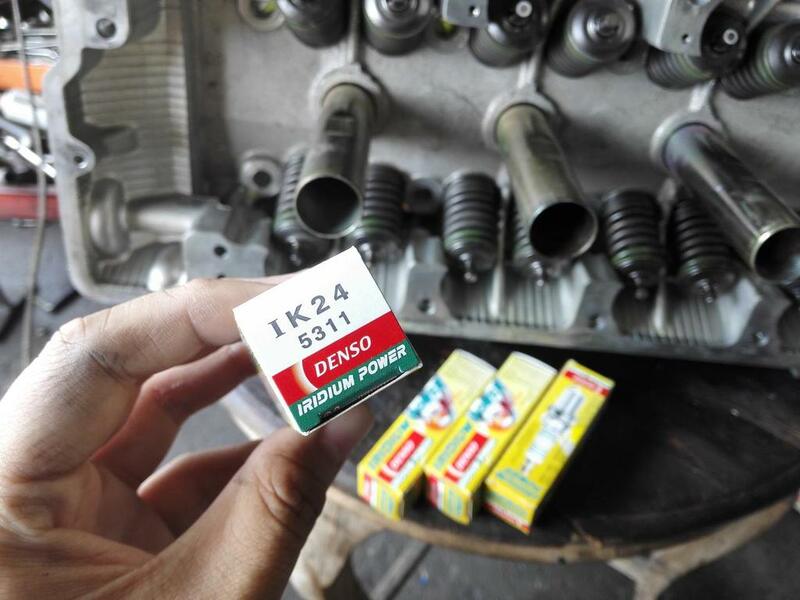 I admit that it is a strong piston but what manufacturing methods they did on it, is a mystery to me until someone from inside Toyota reveals it or someone actually somehow check the composition of it. 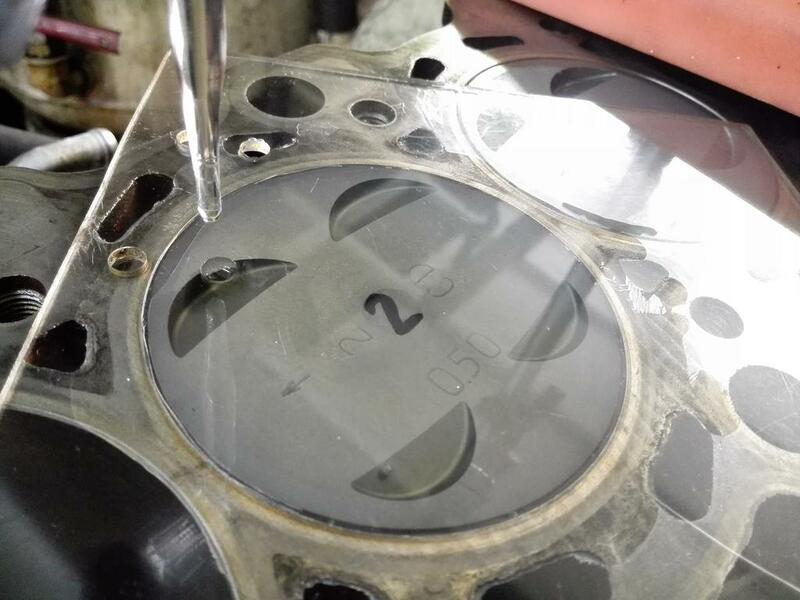 The clearance should be 0.03mm which is slightly tight but I'll be running the engine in for around 3000-5000km for the pistons to set in real nicely. The tight clearance is for longevity and hopefully reduced blow-by and oil consumption. 7. 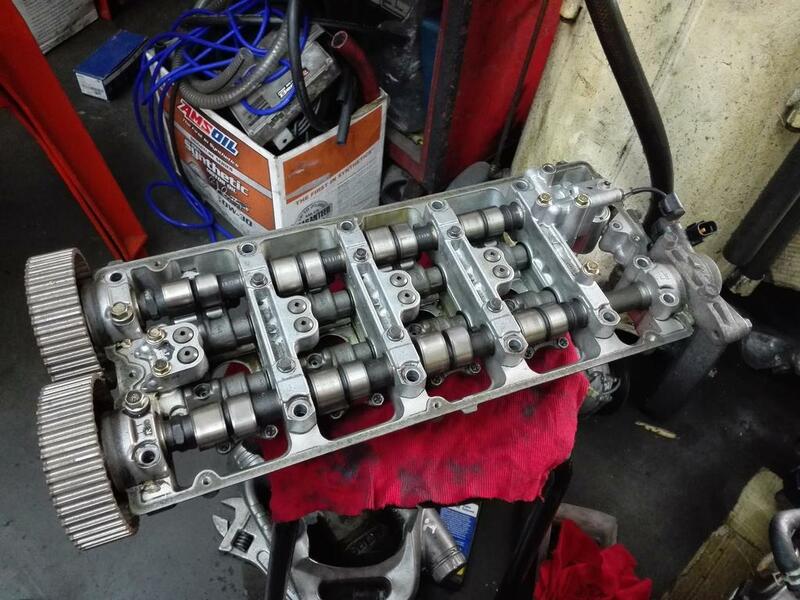 I had not done it on a Mivec engine, but on my old 4g18 engine, I had an oil pressure meter and did the mod as well, and pre-mod the oil pressure always caps out at 4 bar when hot no matter how high the rpm, on a cold start it could probably hit 5 bar at 2000-3000rpm or so. Post-mod, the engine can hit up to 6-7bars(if i recall correctly) at high rpms after warming up and gives me around 2 bars at idle and when really hot on the track, it still gives me steady 4-5bar or so. So yes, in my experience the mod is not just an internet myth, but it actually works. IMO, if the oil relief valve is closed at high RPM, your oil pressure should drop as the RPM climbs even higher. 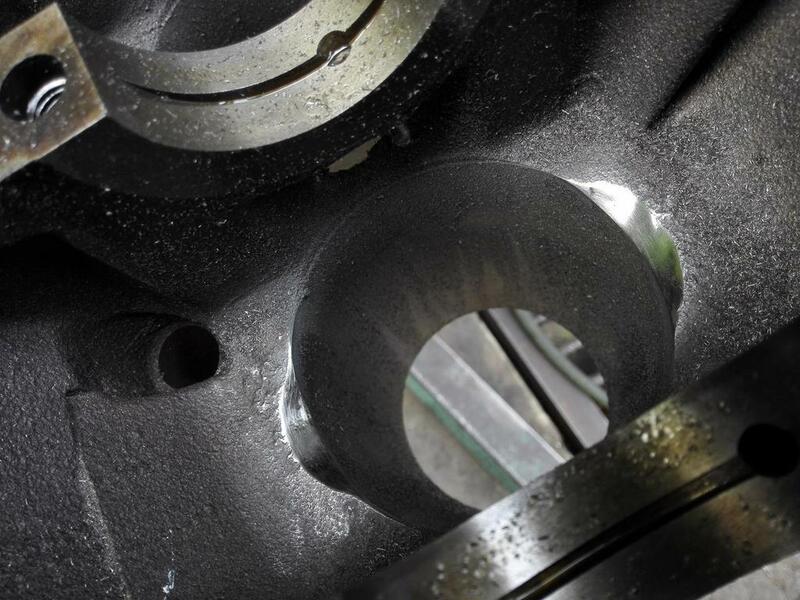 The oil pump must be capable of pumping more oil than the engine is able to consume and relieve the excess oil. 8. 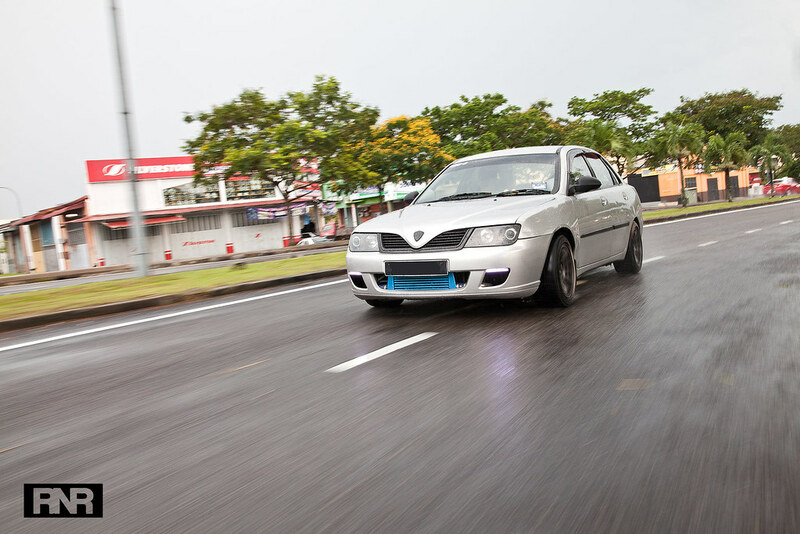 How do you modify the stock BOV? I had not seen anybody doing that before, would you mind pointing me in the right direction? Hope these answers your question. 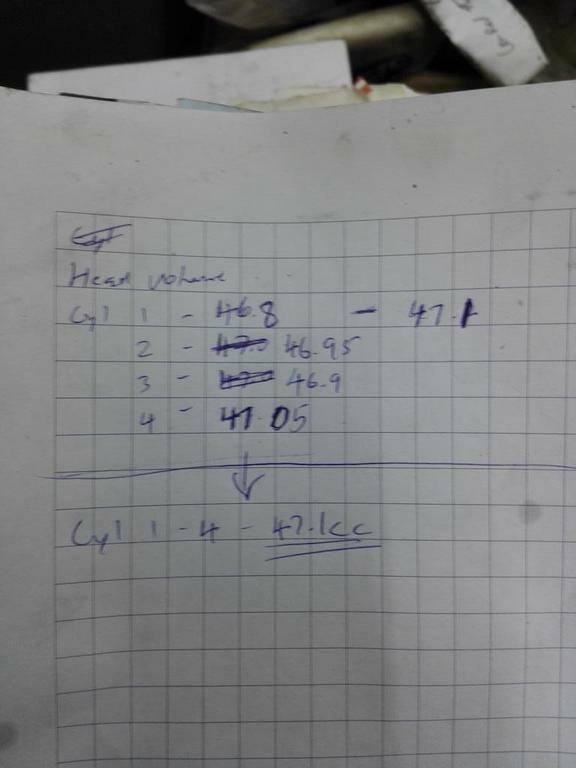 After that, I measure the volume of the cylinder at TDC as well. 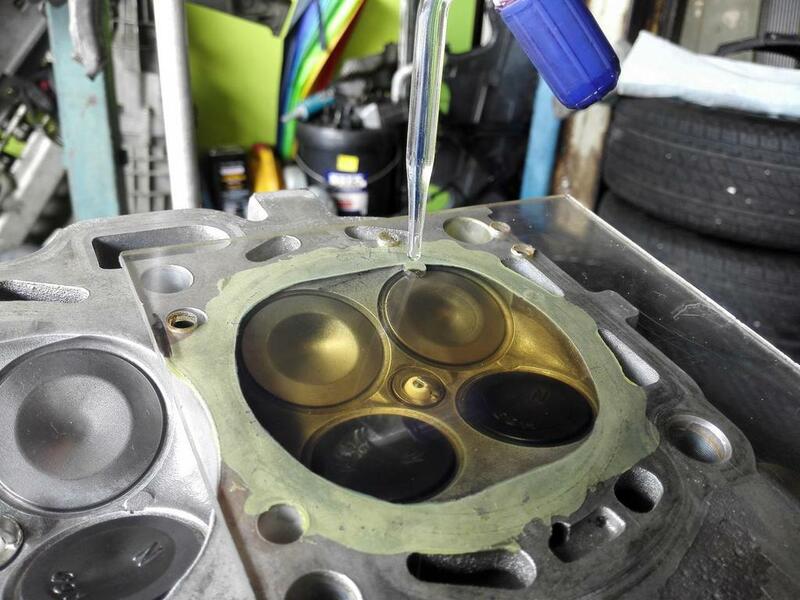 Preperations need to be made to prevent the liquid from leaking and this is achievable by packing the gap between the piston and cylinder with as much grease as you can stuff, then wiping it down after . You can see the grease in the gap. 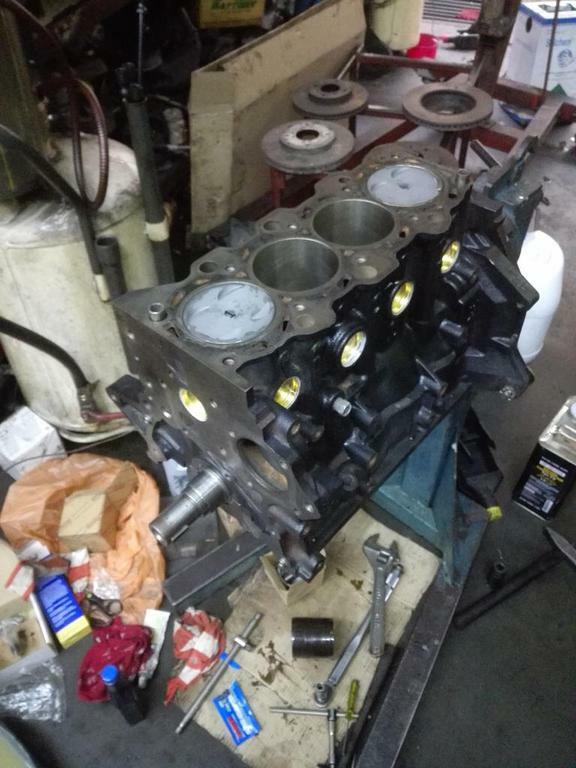 4AGZE pistons are factory forged, I've got a friend who built a 4AGE/7AGE 20 valve turbo hybrid using them. It's still going because he did it right. Spec .012 mm to .014 mm clearance. At your clearance , as soon as it get s hot enough, the block will look the same as your old one. That works, I wouldn't use anything other than a stock one, all the aftermarket ones are junk and don't work properly. I run 2 stock but modded ones on mine. 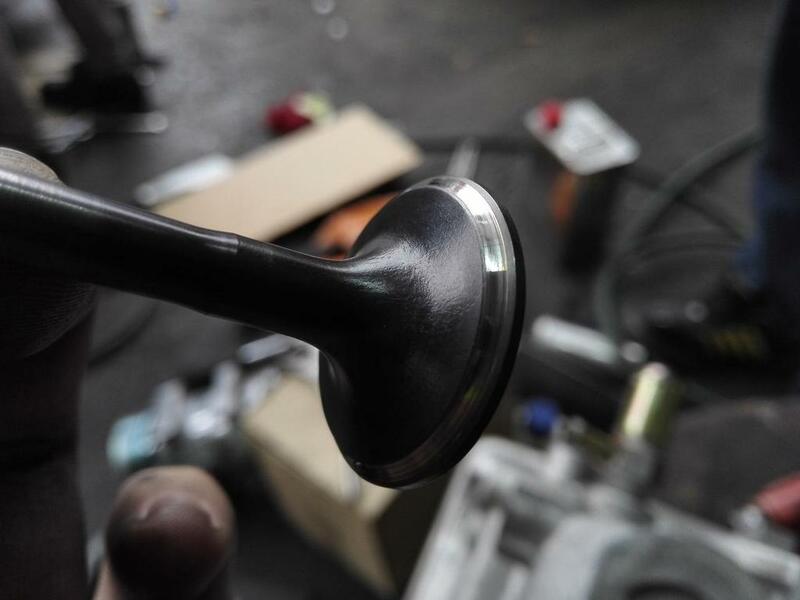 For the crank, yes the oil holes often get champhered on both sides but it only needs doing on the correct side. The CR, hopefully that might work. Don't know about the head work though? I wouldn't be doing that myself, it can only be bad. Thanks for the link to the BOV mod! Seems to be a simple and worthy mod. Odd how I've never heard of that being done by any locals here before. I was actually planning on saving up for a legit SSQV or probably a Synapse BOV, but if the stock BOV works well with that mod, I'll just save my $$$ When you said you run 2 stocks, do you mean you have 2 units on 2 different cars, or both unit installed on 1 engine? The CR should work well, my previous engine was built with that CR as well and ran pretty find both off boost and on boost plus our fuel quality here is pretty decent. Most modern turbo engines have their compression ratios closer to 9:1 than 8:1 anyways, even the 4agze comes in 8.9:1 in the later models, which was where my piston originated from. 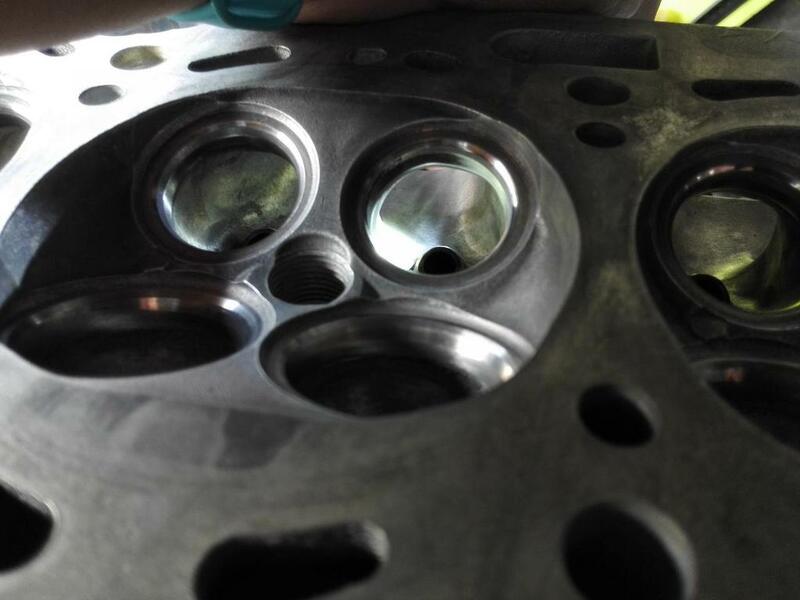 Well, other than grinding the squish band off, the squish effect is also reduced by my increased head gasket thickness and also the fact that my piston is dished, so... Anyways, I only grinded the head at that area very slightly, probably at most 0.2mm in thickness at the thickest part grinded off. It looks like alot as I had smoothen it out with a sandpaper dremel bit. 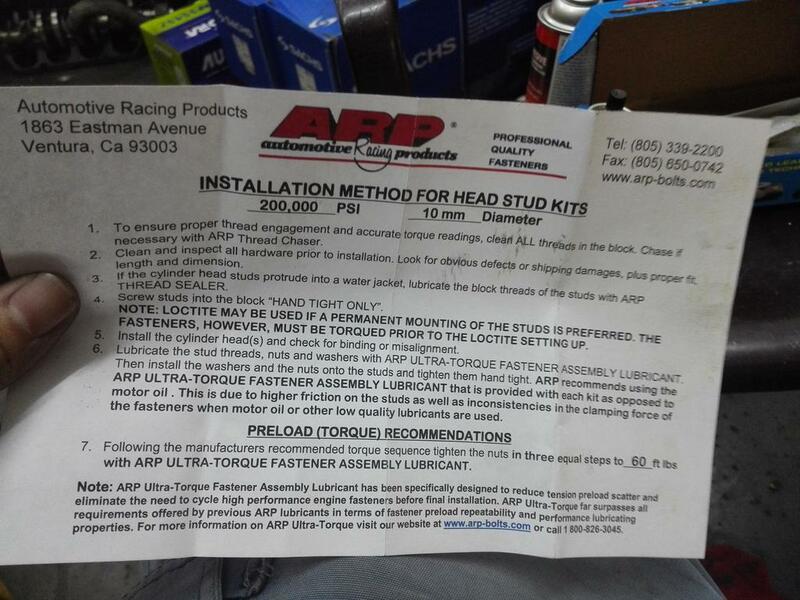 Ooops, yes I got the decimal point in the wrong place but the link to the factory service manual is correct. 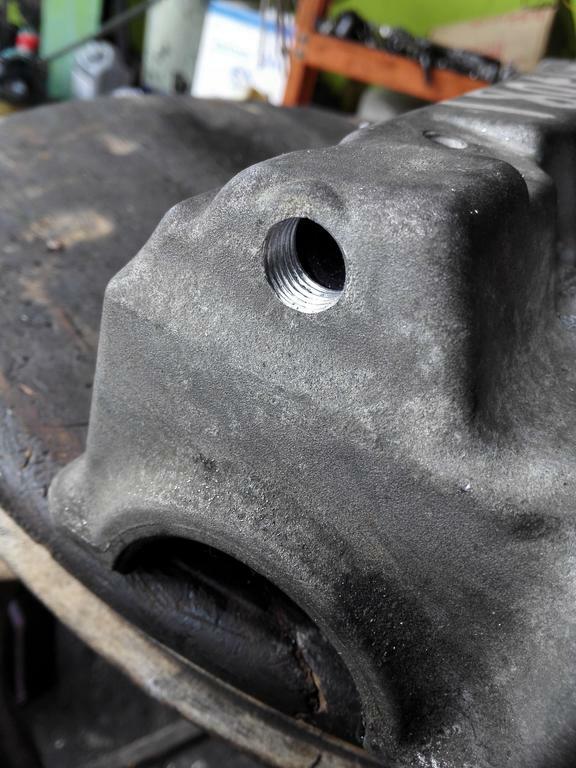 Looking at your old block, you can see the scuffing on the sides of the bores. You really need to work out why it broke because if you don't, it'll happen again. 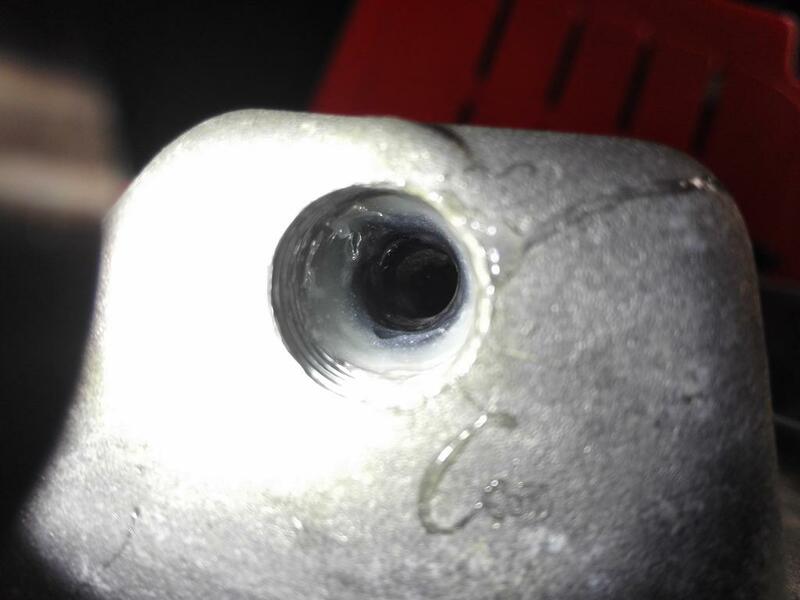 The scuffing indicates the piston got too hot and too tight, seizing in the bore then breaking the rod. It's normal with a bad tune. 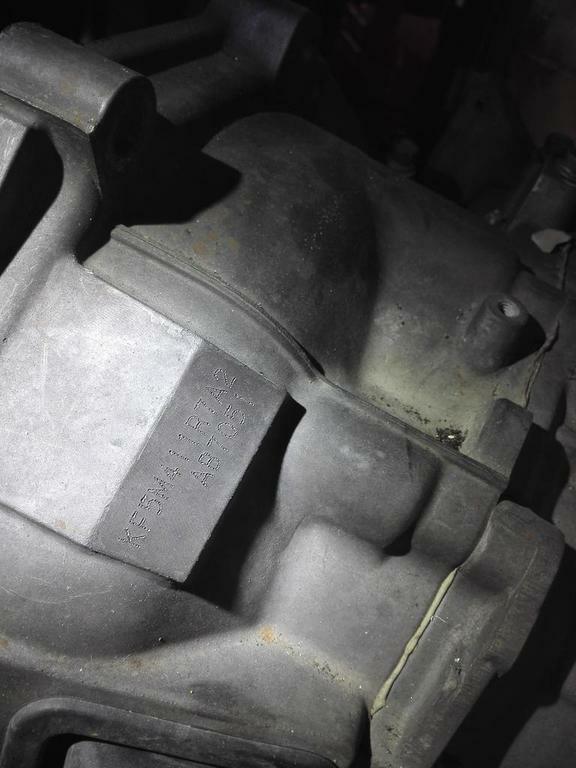 I'll take a guess that the other bores in the broken block look the same. That gets you onto the MS3. You'll find that the knock control won't work properly. That's a whole other can of worms that gets opened. I'll leave it at that and let you figure it out. Yes the link to the manual is indeed correct, I'm just pointing out that their method used to measure piston diameter is really weird. It was always measured at the skirt, not near the crown. Also I asked another local machine shop which had done such job before and he agreed with me that 0.1+mm of clearance is ridiculous. 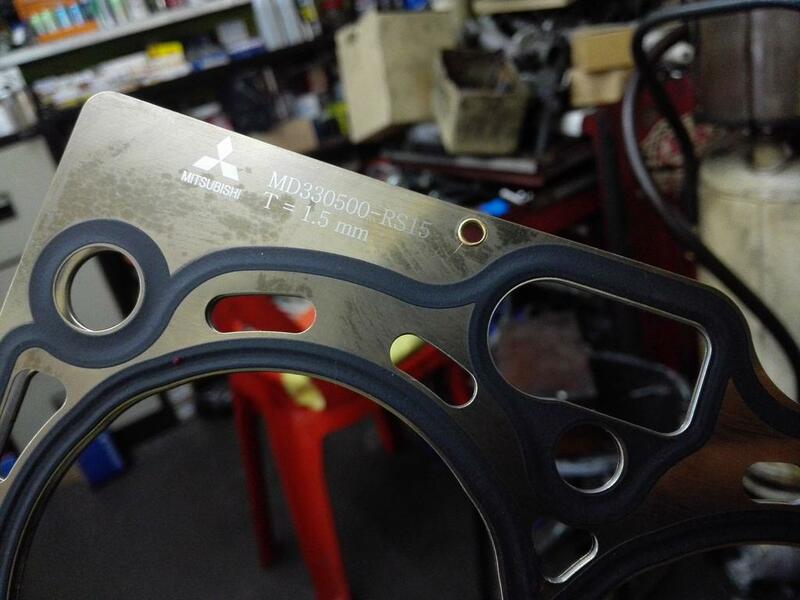 He usually does 0.03mm for daily drivers and 0.05mm or more for race machines and had no issues. 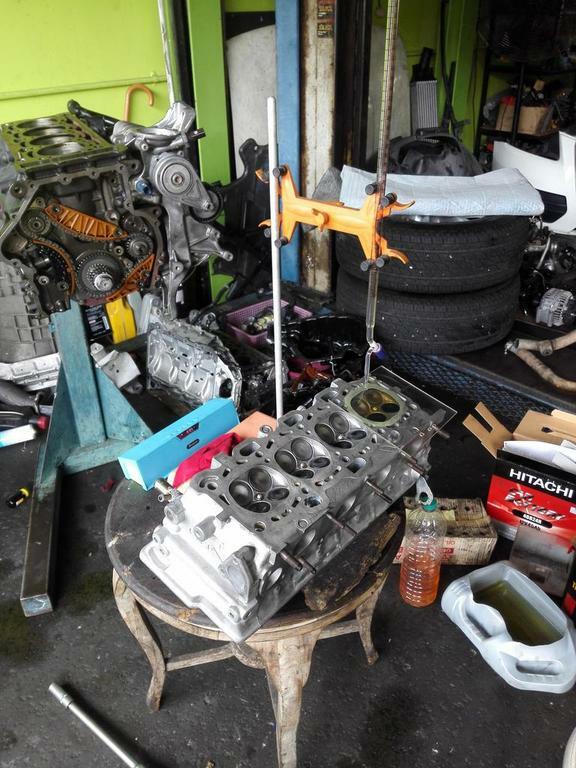 And nope, my old engine definitely did not gave way due to that. 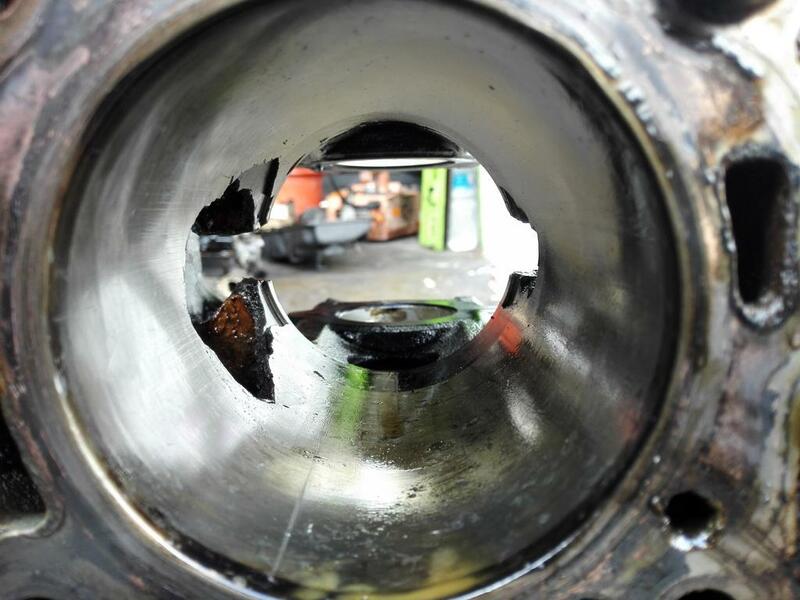 The scratches is only on that cylinder which blew up. If it really had that inherent issue, the engine would've blown on the track day where it was pushed to 100+c water temp and 120c oil temp but it ran extremely well on track with no hiccups at all. At the time it blew, I activated rolling launch control at 5000rpm, held it there for 3 seconds and as the boost build up to 1.3bar, it just gave way suddenly. 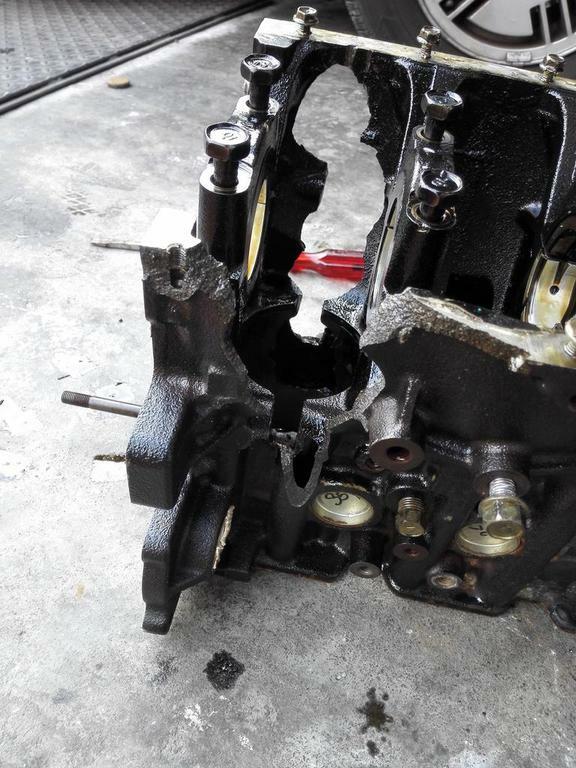 So no, the engine blew was not due to machining tolerances or assembly error. The MS3 really gets unnecessary bad rep from bad installs. If you know how to tune, you'll find that the MS3x is really easy and straight forward to tune, plus features are constantly being added and upgraded since the firmware is constantly being developed. I had been running the MS3x for 2 years and I find the knock protection to work well once calibrated. Not too sure what other cans of worms you're referring to though, do elaborate on that. I tuned my ECU myself on the street for a year before I hit a dyno and fine tuned it there. The MS3x system, if assembled properly, installed correctly and the tuner is really what he's worth, it would be as reliable and just as good as most consumer standalone in the market, at a fraction of the price with even more features. 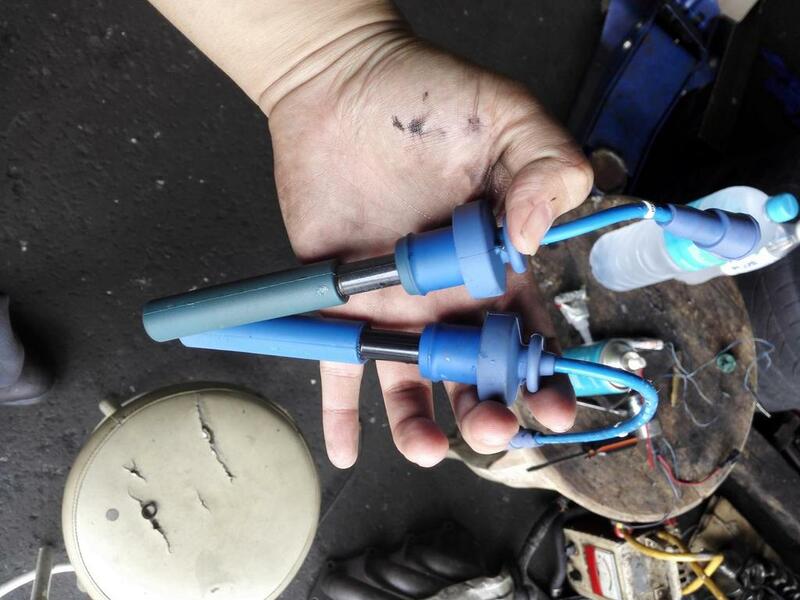 Installing a 4g93t ECU to run my setup will be really inappropriate as I'm running different CR rates, different injectors(gonna run 510cc evo injector), a completely different head, much higher duration/lift cams and also the existence of the MIVEC system. For a frankentstein engine, a stock ecu really would not do justice to the setup and a properly tuned standalone will always be the best. Not to forget I can have boost-by-gear, launch control, AFR safety system, fuel pressure safety system, overheat protection, oil pressure safety system and many more features which ensures the longevity of my engine, of course after setting it up correctly. Installing a standalone is definitely not everybody's cup of tea, but if you're willing to learn and are close to a few local tuners plus access to a dyno, learning to tune a standalone yourself is very rewarding and you gain lots of knowledge in the process, or you can always just pay a tuner to install a standalone system. A basic Motec Sprint 500 should be more than enough to run a setup similar to mine without issues, just without the extra bells and whistles my ms3x has. 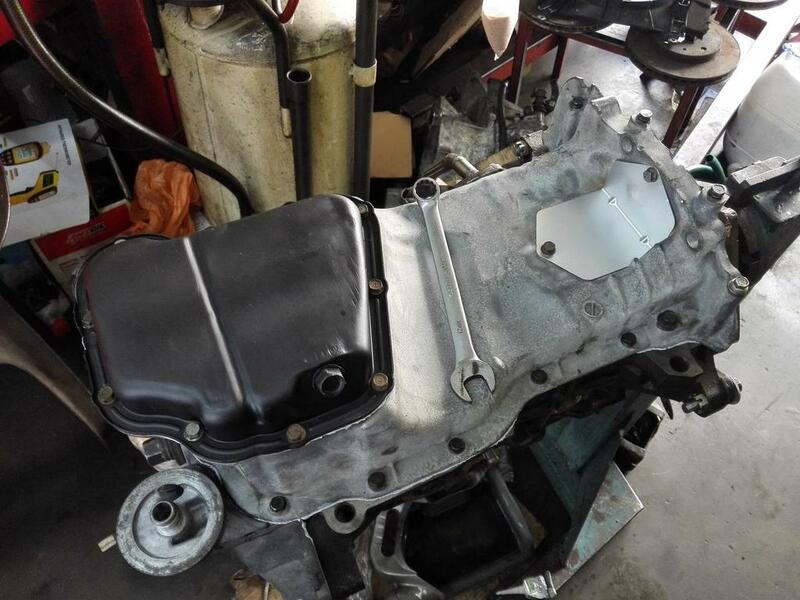 Another update on my engine. Took out the breather port, drilled it larger so that I can fit a larger diameter hose to accommodate the extra blowby from a boosted engine. And inside the cam cover there is actually a rubber hose. After drilling the cam cover, i filled the gap between the cam cover and the hose with some epoxy to ensure the oil/air separator is still working as designed. 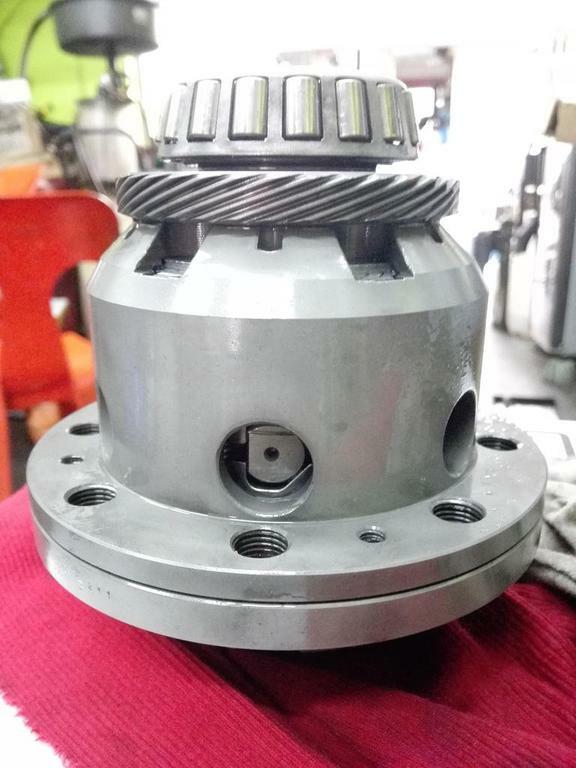 Bought these Works Engineering adjustable cam gears. Says Designed In USA but I highly doubt so. 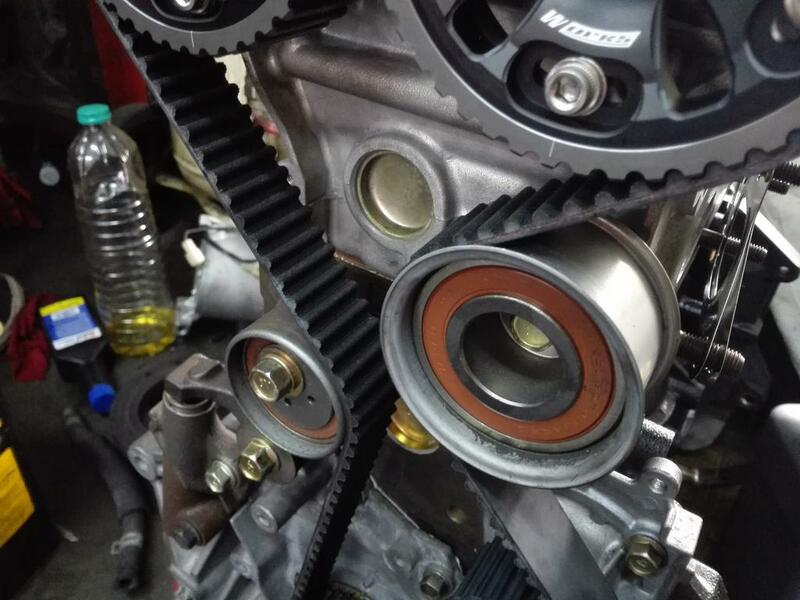 Test fitted the 159t timing belt. With the stock pulley bearing the belt was running a tad too loose. Replaced the idler pulley with a larger one from a 6a12 and it fit perfectly!